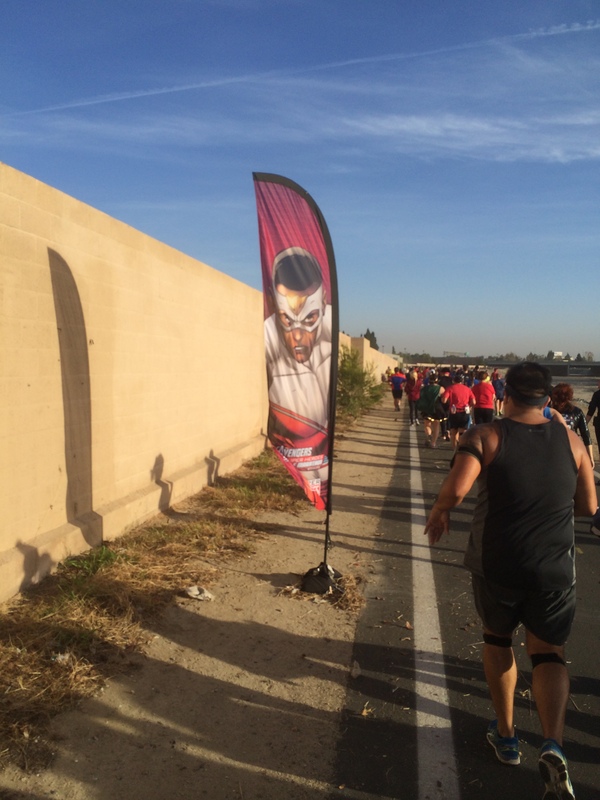 Hydra Agents Stirred Up a Very Windy Half Marathon, but Captain America Prevailed! It all started with a 2:30am alarm. 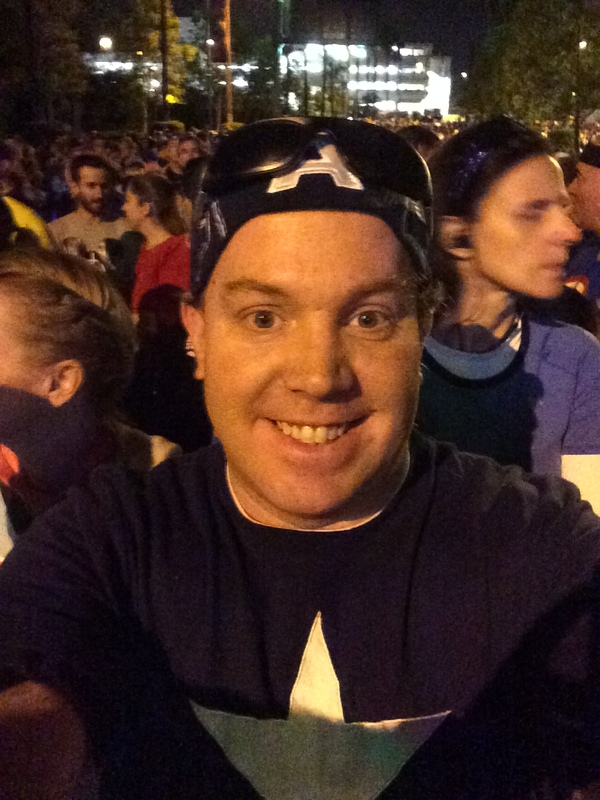 For the first time, at a runDisney race, I started the morning at my apartment. No hotel for this race. I was running this race with a friend of mine and we didn’t get around to communicating about whether or not to get a hotel room for the night before. So, we met at my apartment at 3am to leave for the Disneyland Resort instead. Why so early? Since I’d never driven down for a race before, I had no idea how bad the traffic around the resort would be. 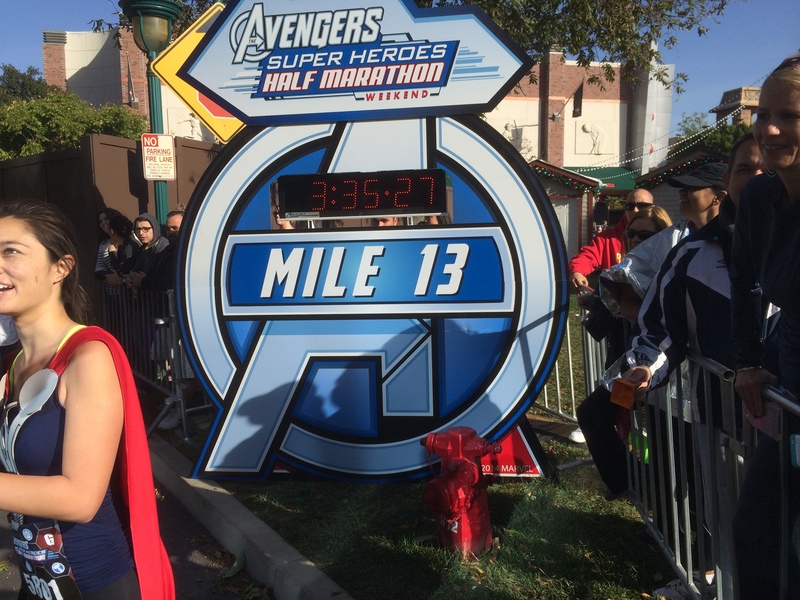 Another friend of mine was going to be part of the Avengers Initiative members out on the race course. He had a 4am call time. On the way, he sent me a text message saying there were some traffic issues on the 5 freeway. So, my friend John and I altered our course to the parks. It worked out great. We made it to the parking lot in record time…35 minutes! To my surprise, there was only one car ahead of us in the lane we used to get into the Mickey and Friends Parking Structure. So, parking was a total breeze. By 10 minutes before 4 am, we were off to the starting area! 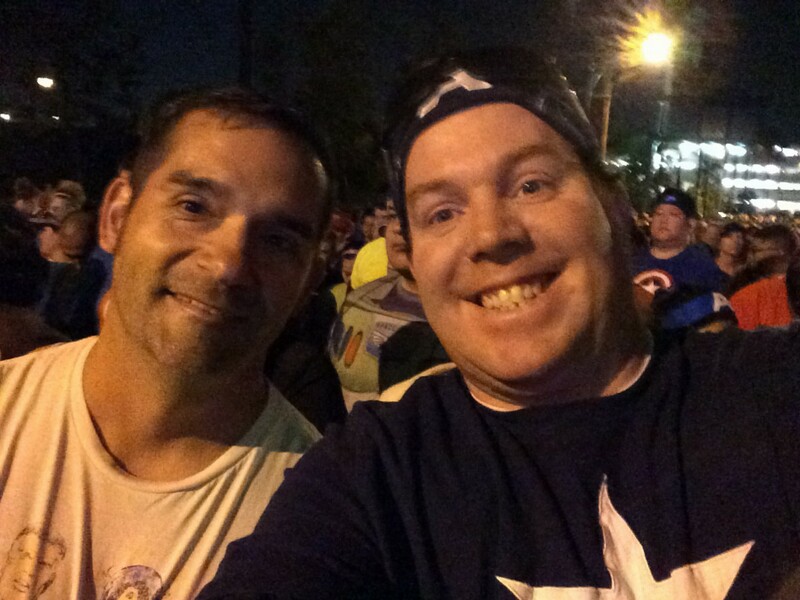 I had read something about a possible meet up for the Team #runDisney Facebook group before the race at 4am. So, John and I headed to where those meet ups usually take place. No one was there. So, I assumed we either missed the meet up or it didn’t happen. We headed to the family reunion area to wait for the corrals to open up. While we were there, Disney had some entertainment going on the main stage. It was kind of cheezy. 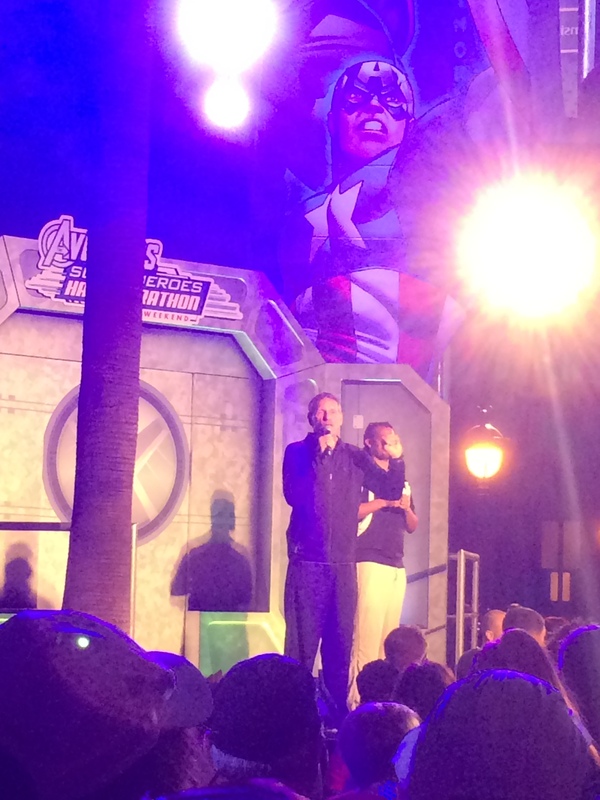 The MC was trying to get people to do various dances to keep Hydra away. It was the kind of thing I’m sure a lot of Marvel fans feared would happen once Disney got control of their characters. At around 4:45, we were off to our corral. John didn’t give an expected finish time because he read the form wrong. 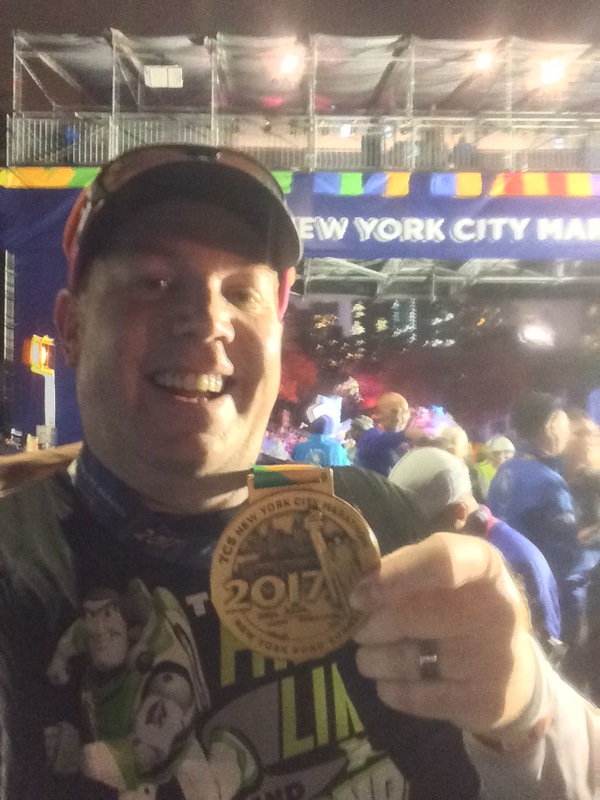 He thought the form was asking for a runDisney event to verify your finish. 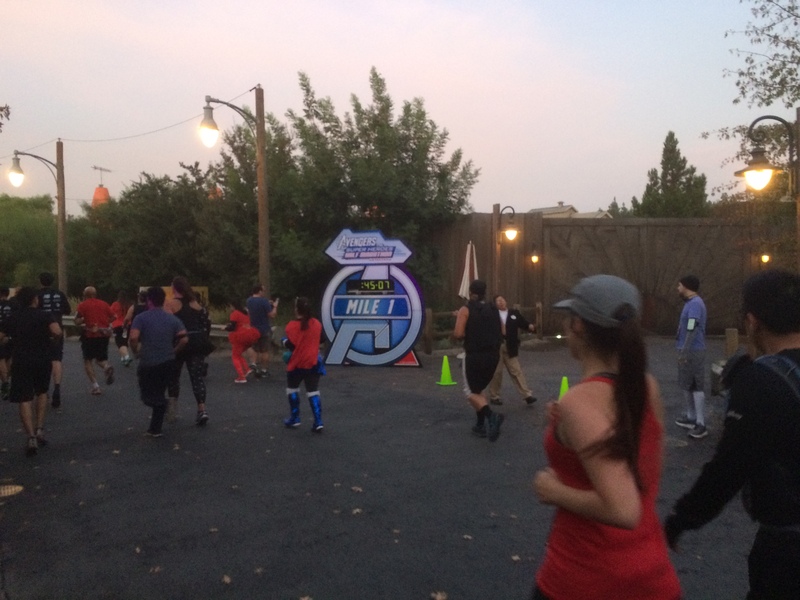 Since this was his first runDisney event, he left it blank. So, he was in corral H. I was in G, but went back to H to hang with my friend. You should know that John usually does around a 4 hour, 30 minute full Marathon. 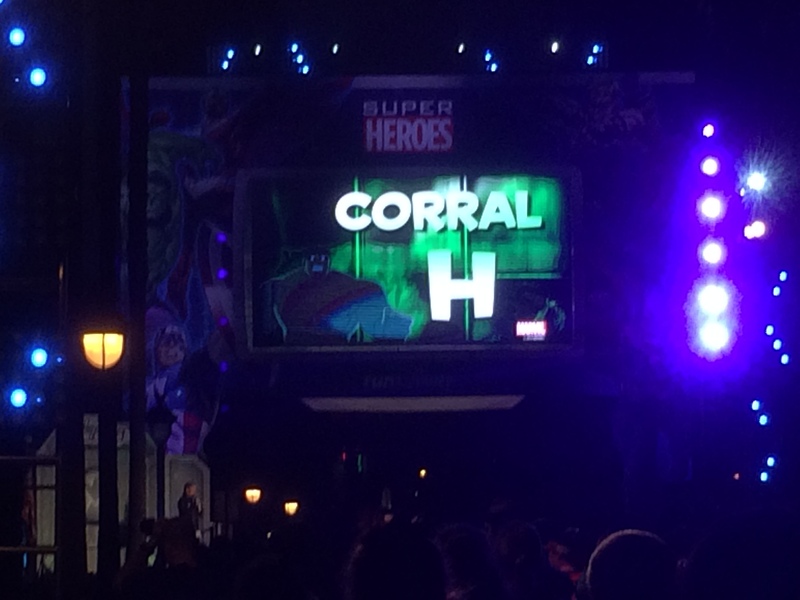 So, corral H was not where he should have been. Anyways, as we waited, he was blown away at how many people were running this race. John has mostly run the local, smaller races. While we waited, we talked about the course and with others around us. He was pushing to get us to the very front of our corral if possible. Here we are while the other corrals started. John liked the fireworks during the national anthem. Sadly, as Corral G started moving forward to get ready for their start, he had to use the restroom and took off. I wouldn’t see him again until after the race. 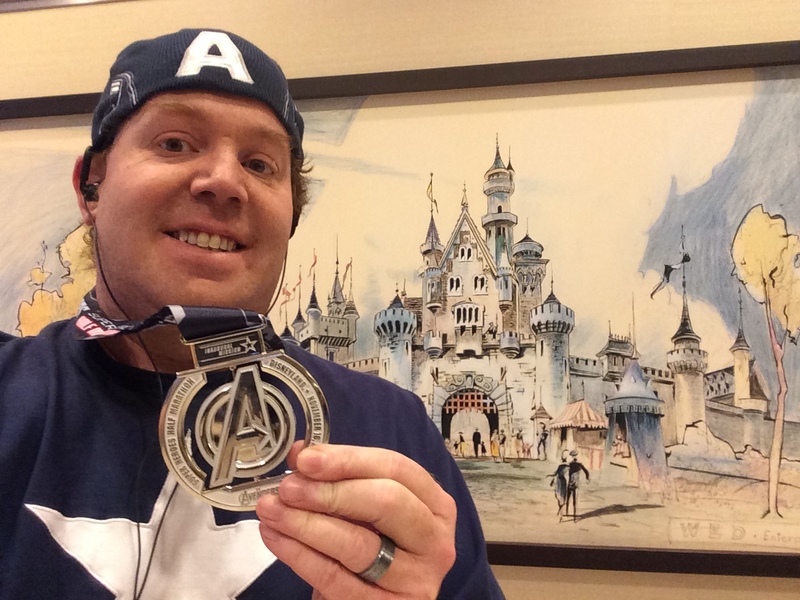 John finished the Avengers Super Heroes Half Marathon in under 2 hours. Yep. Corral H was not the best place for him to have been. With John gone, I prepared myself to run the race solo. Eventually, we got to move forward. 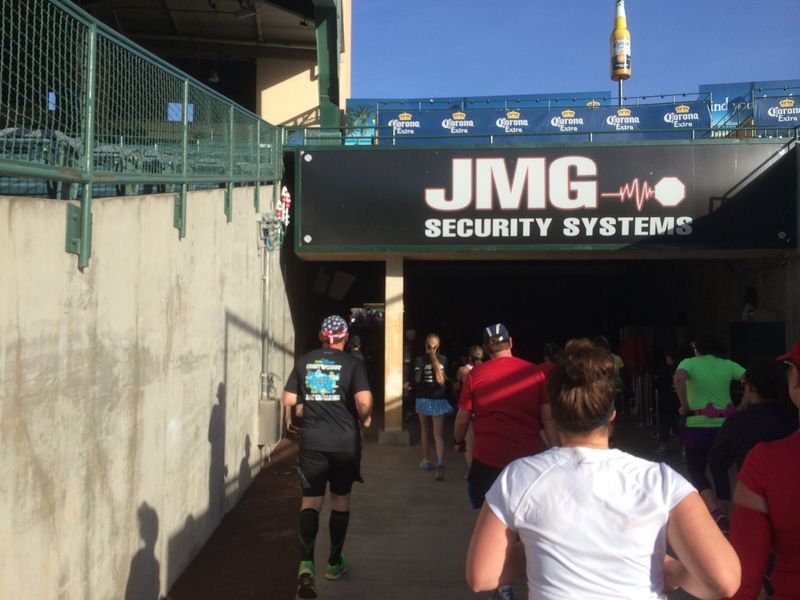 As we did, I immediately began to rethink part of my strategy for the race. 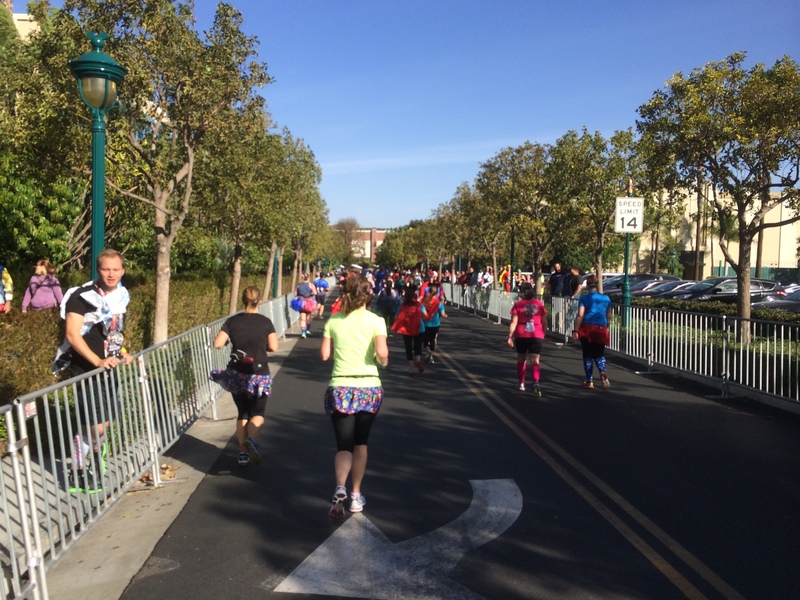 Since I was now in the last corral, I wouldn’t be stopping as much as I originally planned. Thanks to Johns getting us close to the front, I was in a great position to start the race. We got close and Rudy gave us our final pep talk. By this point. Carissa was at the finish line. Before we knew it, the time had come for the race to start! It was time to Smash the Half! 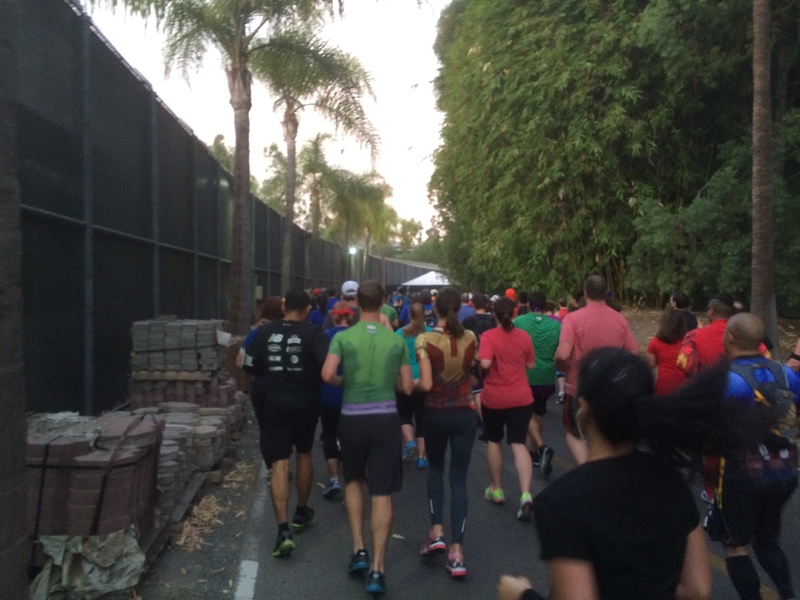 So, we took off down Disneyland Drive, just like the Disneyland Half Marathon. 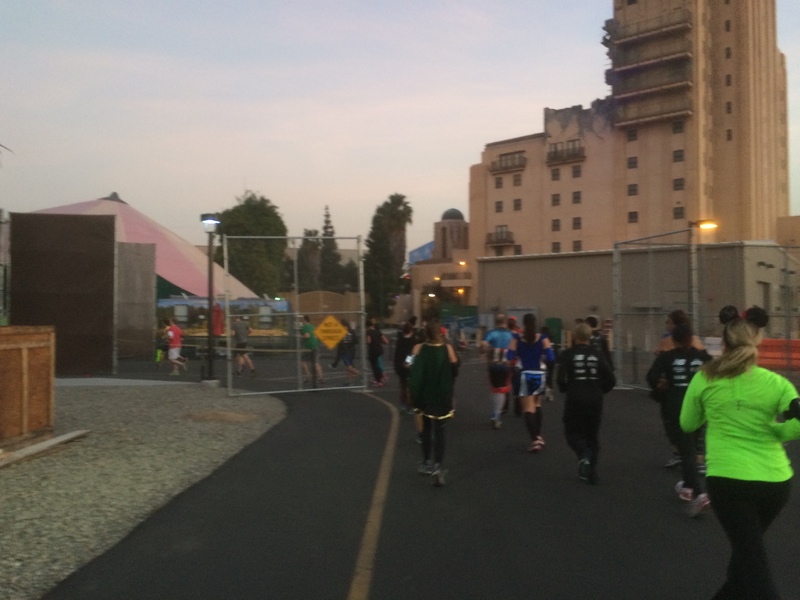 However, before we could get to Katella, it was time to turn and head to the backstage area of Disney California Adventure! The sun was coming up and I was cruising along. Intervals in the start went along just as planned. 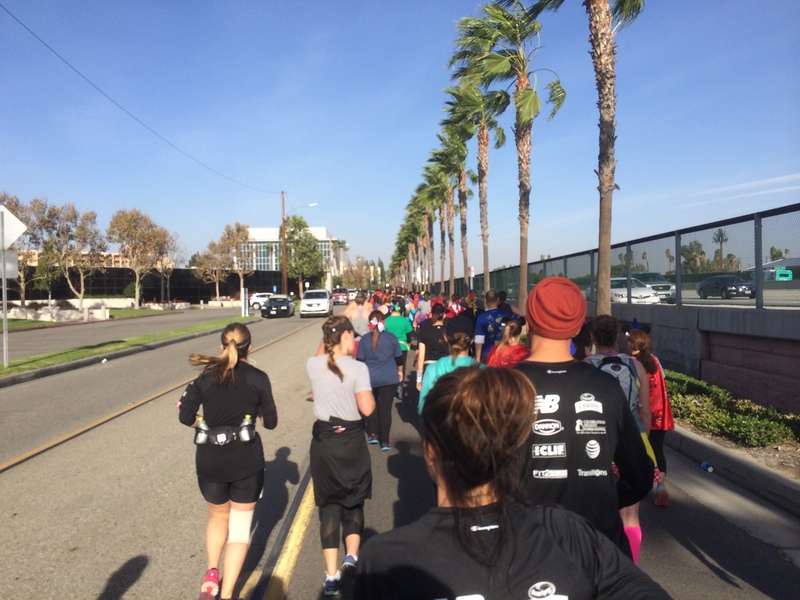 I was having a much better first mile than I did at the Disneyland Half Marathon. 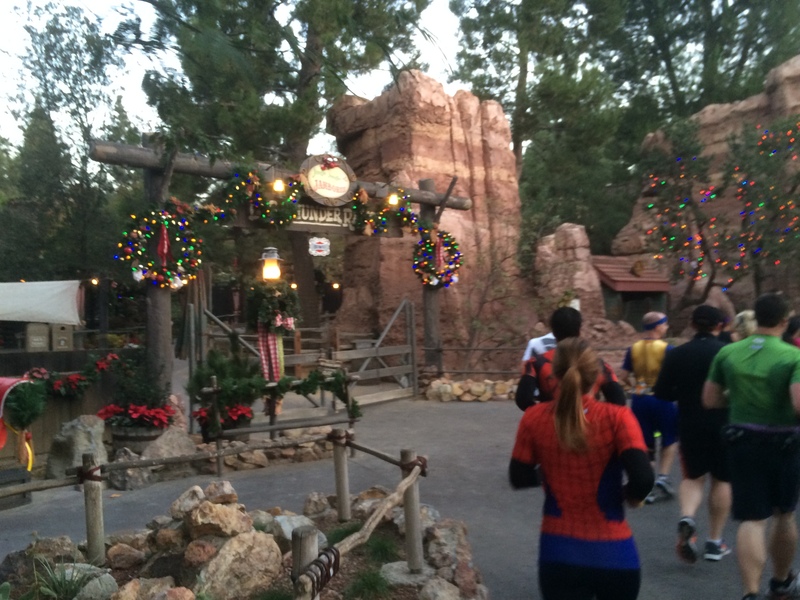 We wrapped our way around to behind the Radiator Springs Racers…. 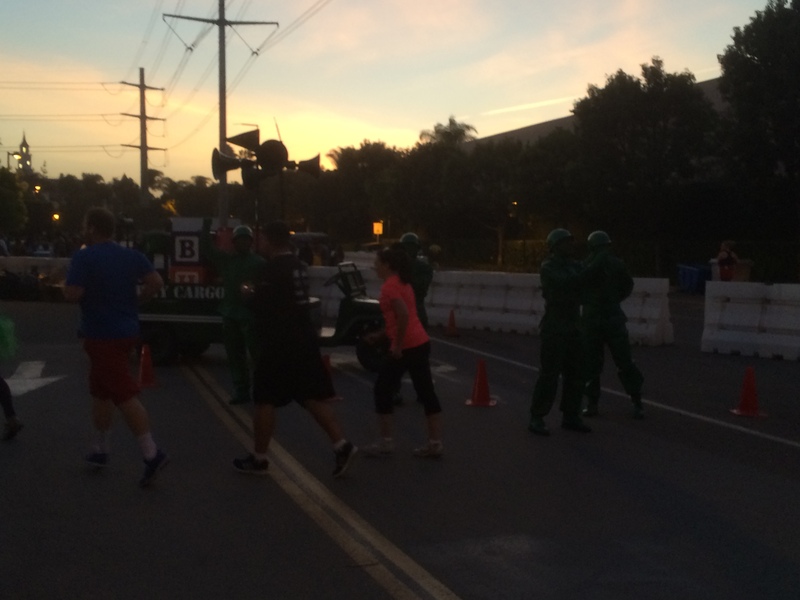 Then, we came to our first characters on the course…the Green Army Guys from Toy Story! 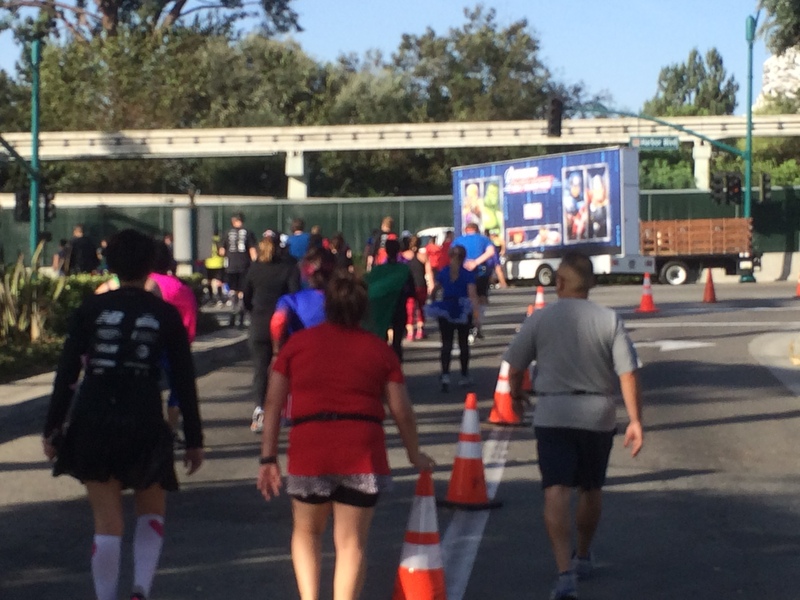 I didn’t stop, but it was cool to see characters in the very first mile! 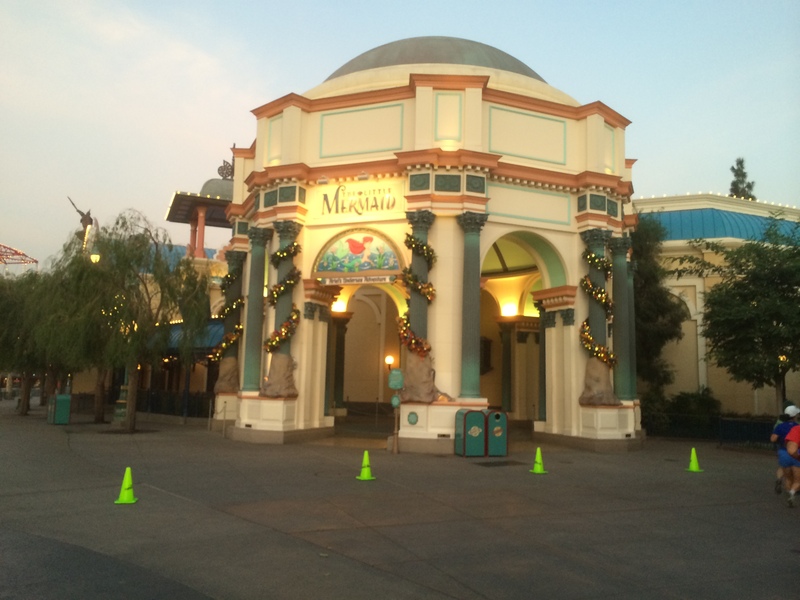 Then, it was time to go into Disney California Adventure! 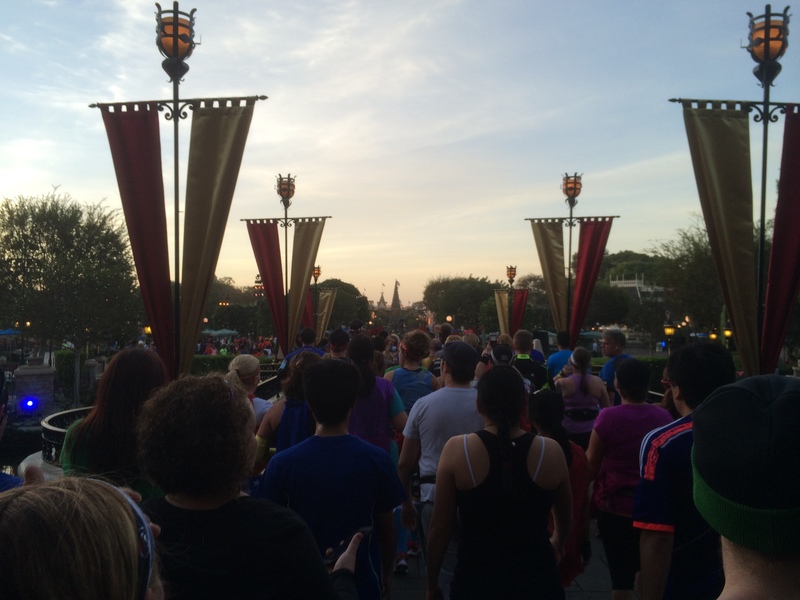 We weren’t inside the park long before we crossed the first mile marker! I got here in around 11 minutes. It was a much faster start for me! I loved the cooler temps and was feeling great! 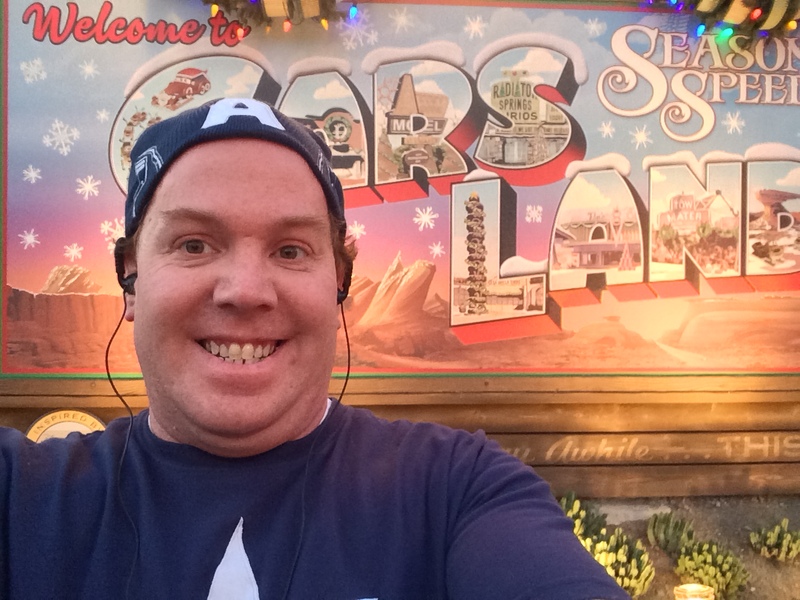 Then, it was time to head down Route 66….aka Cars Land! Yes, fun times indeed! So, my first stop came with this Christmas Tree in front of Sarge’s Surplus Hut. 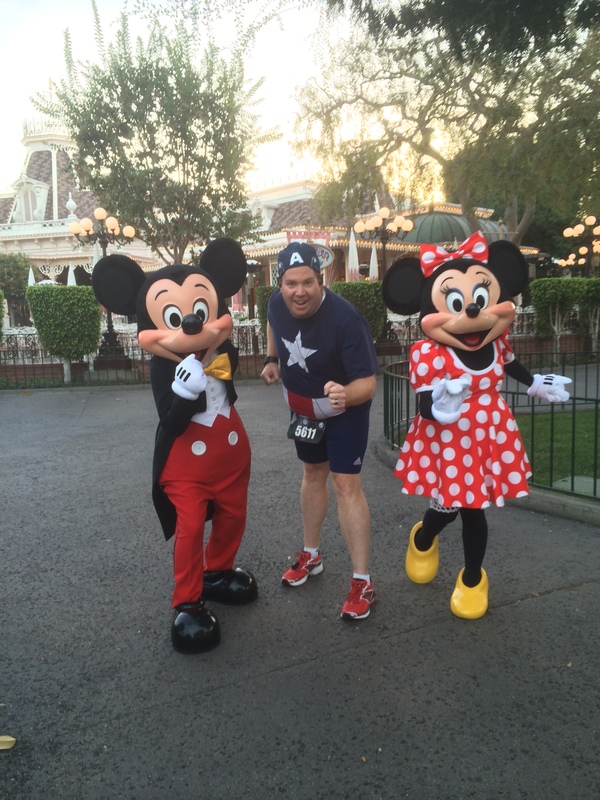 Since I got a picture with Lightning McQueen and Mater at the Disneyland Half Marathon, I skipped it this time around. I love Cars Land at Christmas time! This might be a good Christmas Card picture…don’t you think? We turned at the Little Mermaid: Ariel’s Undersea Adventure. They had this attraction all decked out for Christmas as well! The Grizzly Creek Rapids. Across the way, there were some characters from Up for pictures. I was on a run interval and chose to skip this stop as well. Right outside of Soarin’ Over California was the very first Avengers Character stop. This one was for Hawkeye. The line was massive. 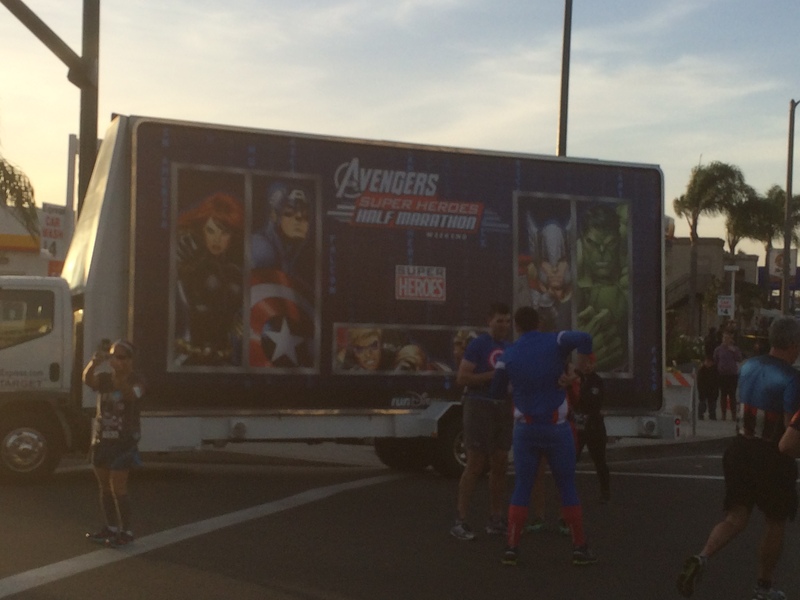 I had read that in the Avengers Super Heroes 5K, the lines for the Marvel Characters were super long. So, it was advised to pic and choose which ones you’d stop for. If I was in Corral G, I might have stopped. However, I couldn’t do a 3 hour, 30 minute half marathon. So, I just took a picture as I passed. Faster than Captain America, we were out of DCA. It was a shame that this race had so little time in the parks. We barely touched DCA and were out. 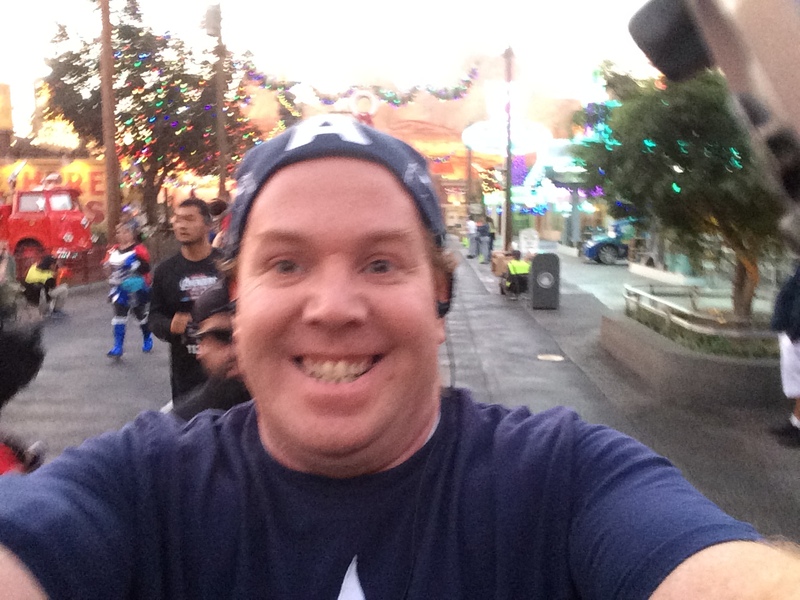 When I did my recap of training on the Avengers course, I guessed where we’d enter Disneyland and was wrong. As I ran this race, I was honestly surprised how much of the guesses I got right. This was not one of them. 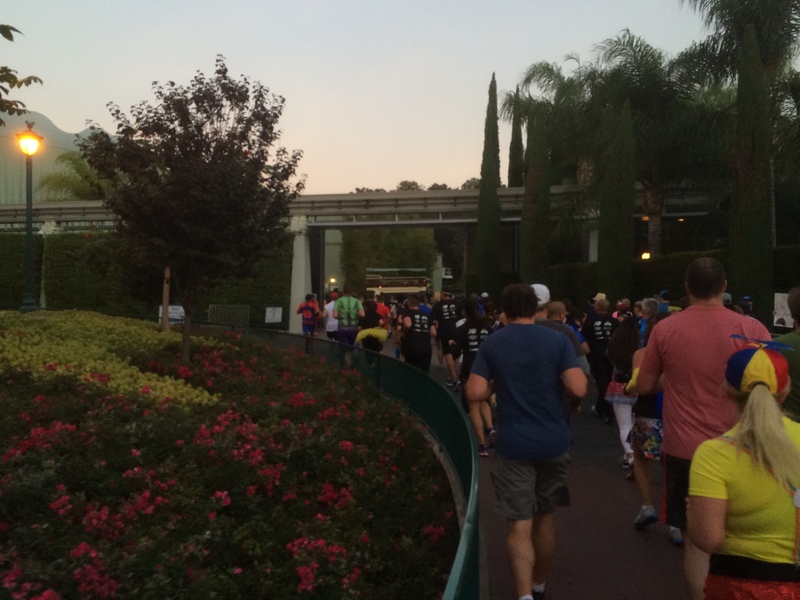 At the Disneyland 10K, we ran the opposite way down this stretch. We entered Disneyland’s onstage area in Critter Country. We wrapped around passing by the Haunted Mansion. I love the Nightmare Before Christmas Holiday overlay! If you’re ever at Disneyland for Halloween or Christmas, you need to ride this attraction! Ah, passing by Pirates of the Caribbean! My favorite attraction at Disneyland! Okay, time for more racing. Shortly past this picture was the place you could get a picture with Thor. Again, the line was massive. 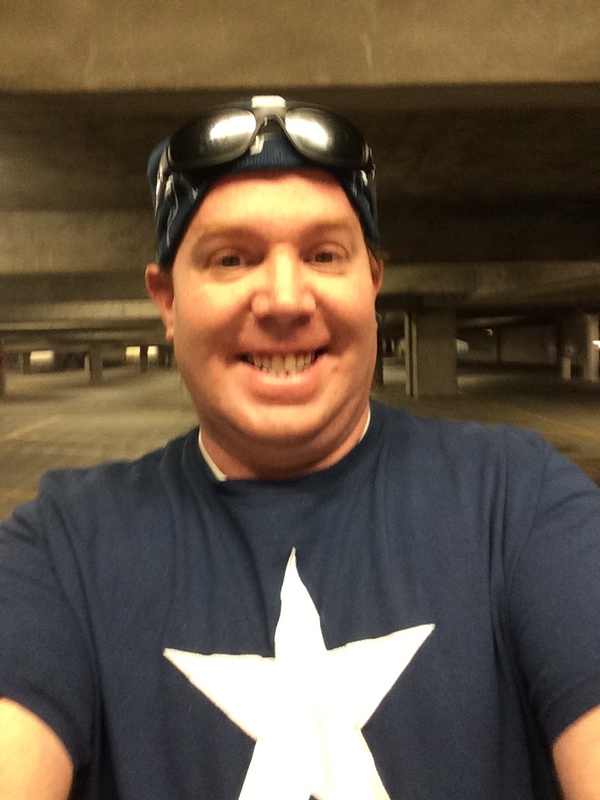 So, I had decided to hold out for Captain America….no dice. He wasn’t on the course until the finish line. We went around Big Thunder Mountain and passed the Big Thunder Ranch. I was seriously digging the Christmas decorations! 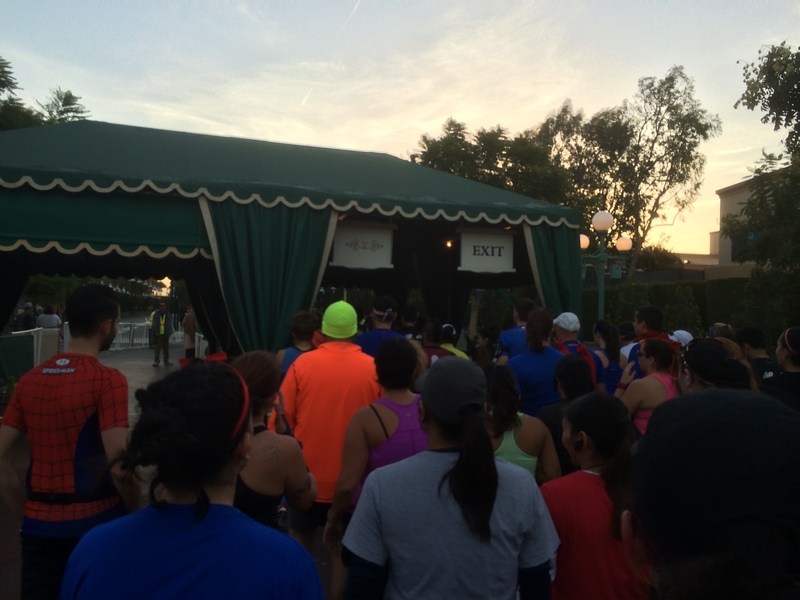 What was unfortunate was how slow and go the course was through Disneyland. 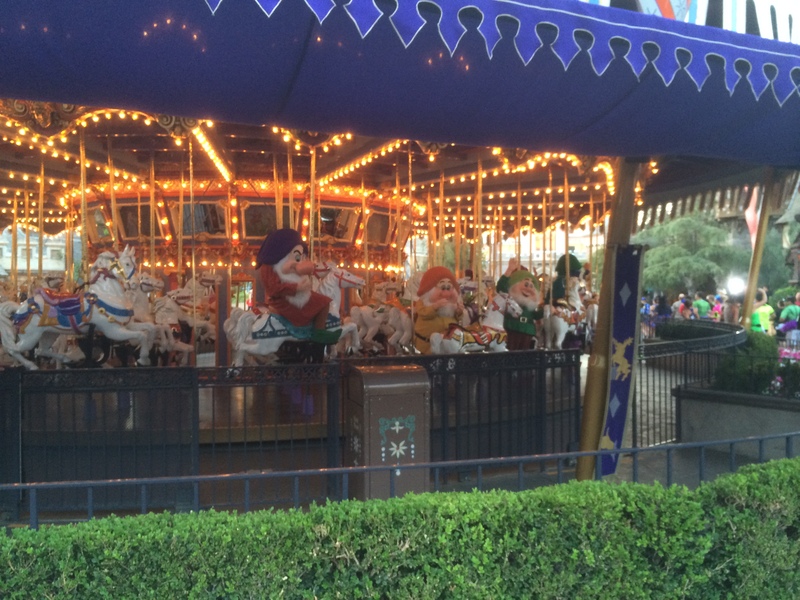 We wound up in Fantasyland where the Snow White and the Seven Dwarfs were riding King Arthur’s Carousel. Lots of runners were stopping for pics. I could see that my time was getting away from me and had a quick debate on how long to stop. I chose a brief stop and picture. With this picture, I actually just hoped it came out okay. Then, it was time to storm the castle! So cool to see the fake snow at the top! 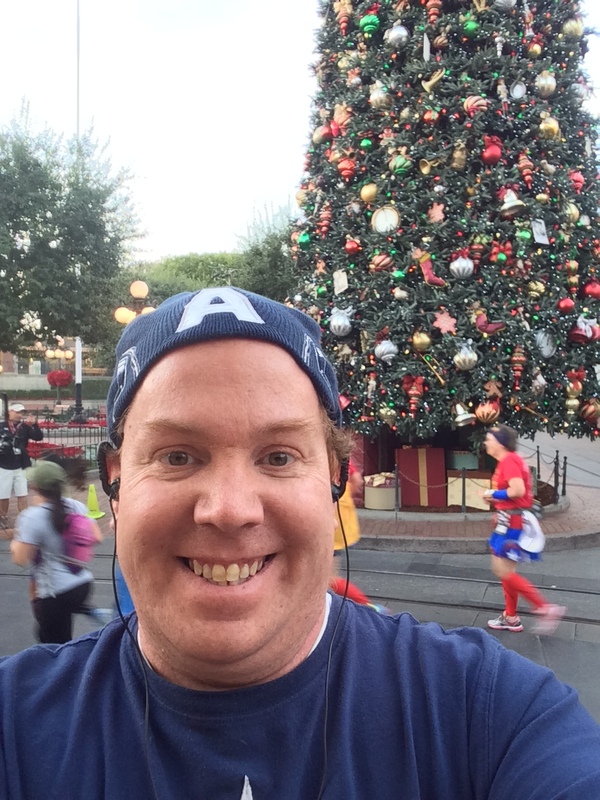 I love Christmas at Disneyland! 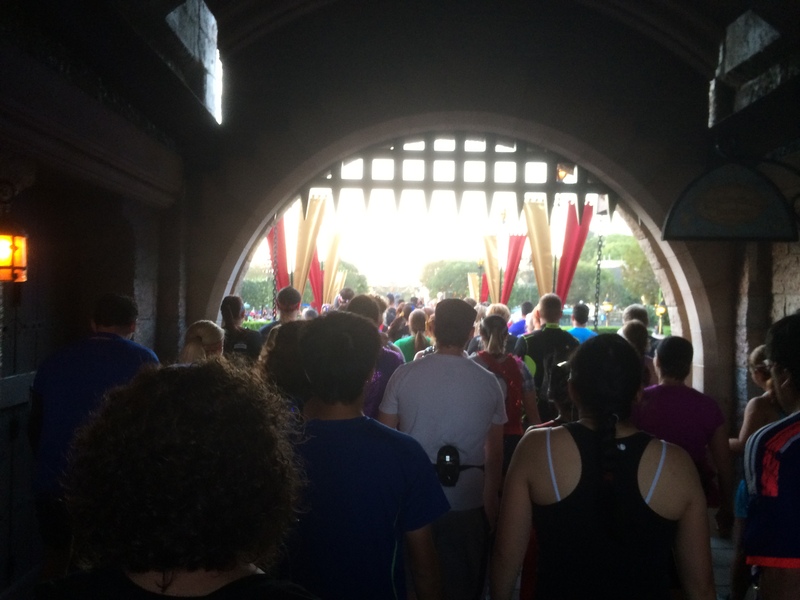 Too many of us storming the castle means a total bottleneck. Yikes! 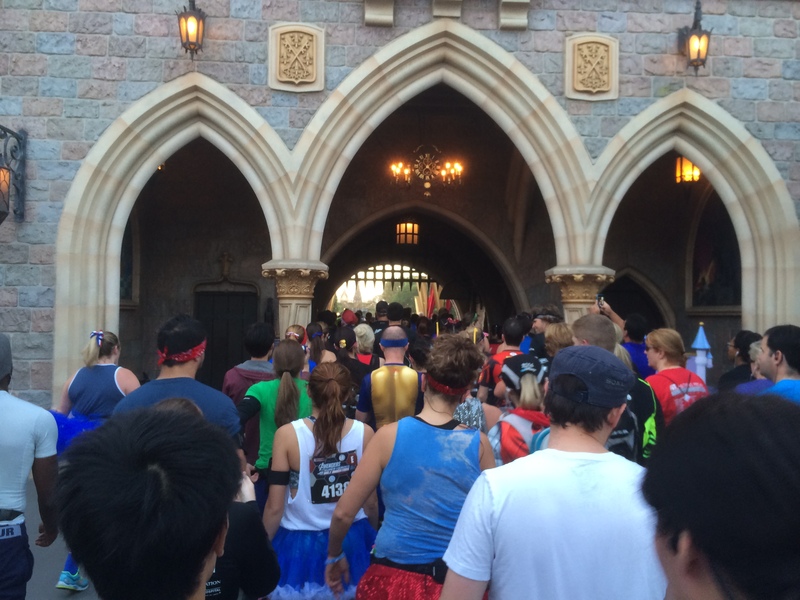 I know that running through Sleeping Beauty’s Castle isn’t the same as running through Cinderella’s Castle at the Magic Kingdom. However, it’s still fun…even if you’re actually walking…slowly. Once we got through, it opened a little. 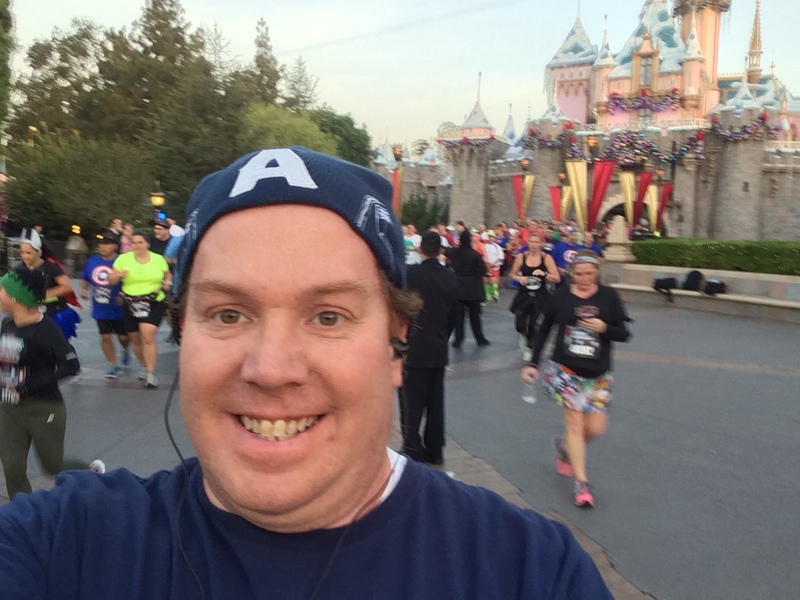 Since you can’t always count on the Marathonfoto guys to actually take a picture of you with Sleeping Beauty’s Castle in the background, I took my own again. This one is cool because it’s all decked out for Christmas! 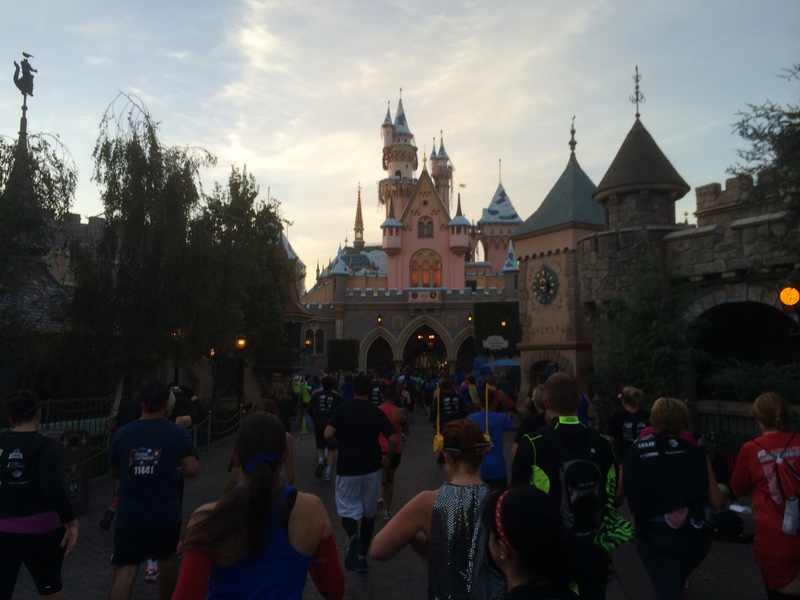 Unlike the Disneyland Half Marathon, we headed straight down Main Street U.S.A. after Sleeping Beauty’s Castle. With no Captain America in the parks, I was a little bummed. However, I noticed that the line for Mickey and Minnie wasn’t too long. So, I thought I’d wait because I have never taken a picture during a race with Mickey. The line took 5-7 minutes to get through. So, it was hurting my time. I was a little worried as I kept staring at my watch. But, I really wanted one character stop and it was Mickey and Minnie. Therefore, worth the risk. Then, I was off down Main Street U.S.A. I’ve got to admit, I loved running down Main Street U.S.A. with all the Christmas decorations! Another possible Christmas Card picture? 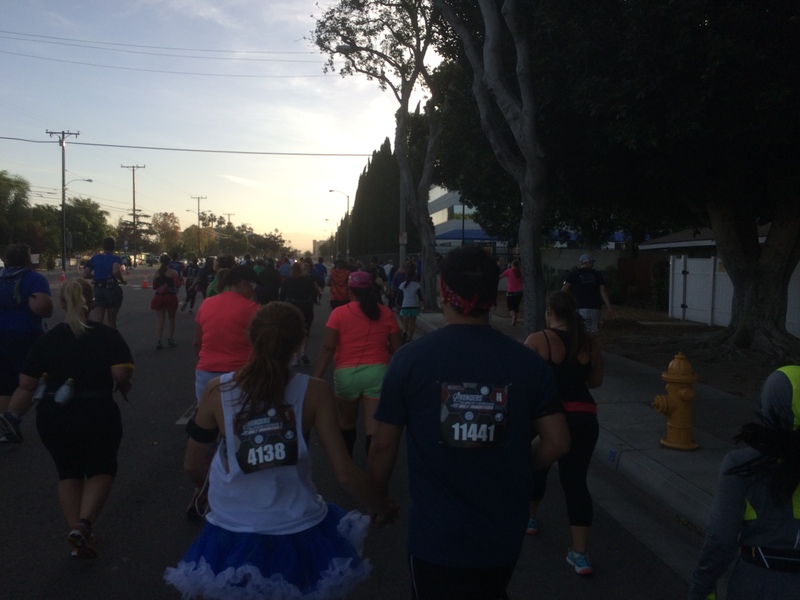 Hmmm….oh, yeah, I’m in a race. 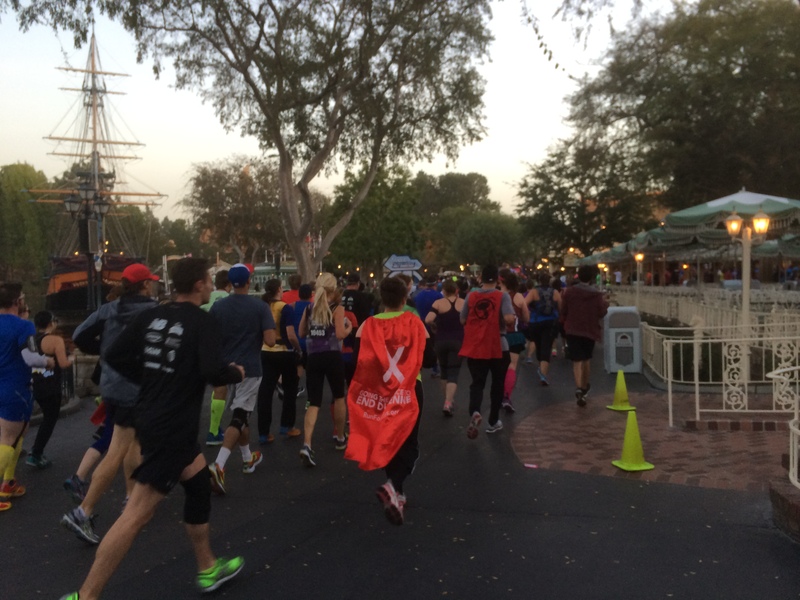 As we made our way out of Disneyland, I started thinking about how to approach the rest of the race. My time was really slow. 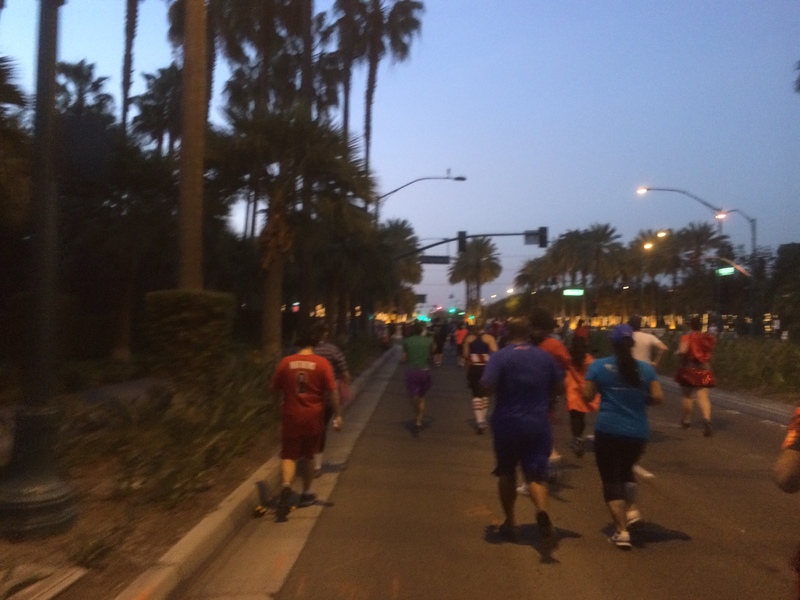 OK, runDisney…seriously? 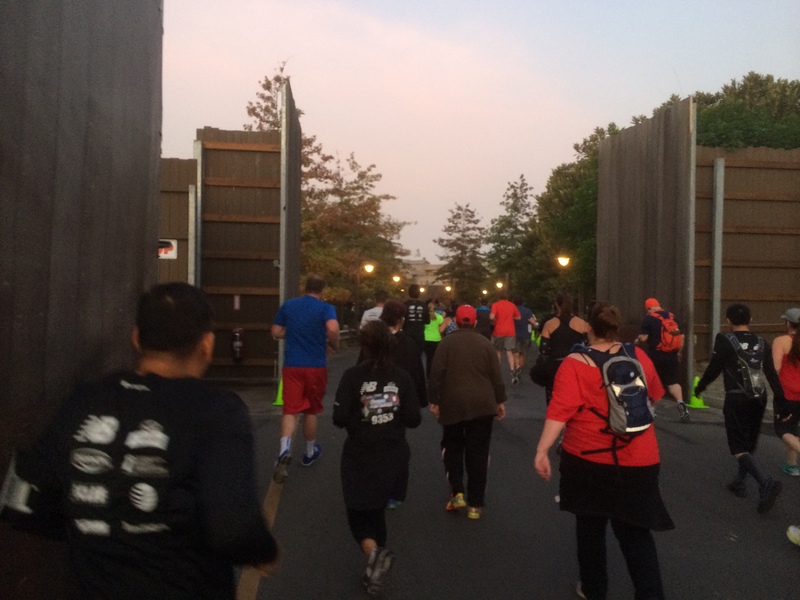 Only 2 security check lanes open for all these runners? Come on now. I wasn’t too happy about this bottleneck. So were other runners. We were looking at the unused lanes and wondered why they weren’t open as well. Once we got past the security point, I was itching to hit the open road. I decided that I’d go to a 1 minute run/1 minute walk once I got on the streets. I needed to make up some time. This fun, huge sign was somewhere around mile 3 or 4. Here’s a better picture. Anyways, when I crossed the 5K mat, I couldn’t believe how much time had passed. 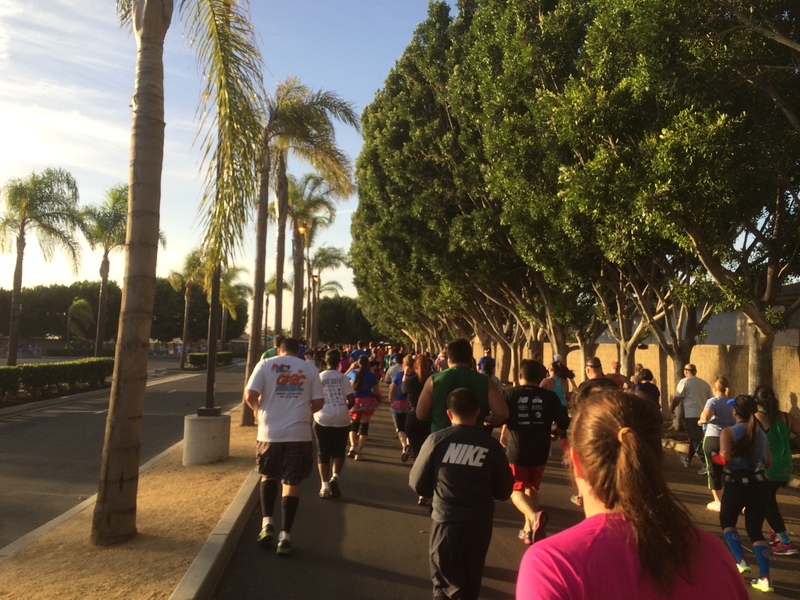 It was my slowest 5K ever! 47 minutes! This was so not cool. Even with this slowness, I was comforted to see in the race alert that my estimated finish time was 3 hours 20 minutes and change. Even with all the slowness and stops, I was on target to still beat the max time allowed. This is a scene that we’d see a lot on the course. The winds picked up dramatically after we left the parks. It was crazy y’all. My 4th mile was back to a much better pace. I was running 1 minute/walking 1 minute and feeling comfortable with that. Even with the wind. When we turned up Chapman Avenue, I put on the sun glasses even though they weren’t needed to protect from the sun. I needed them to protect from the dust blowing. 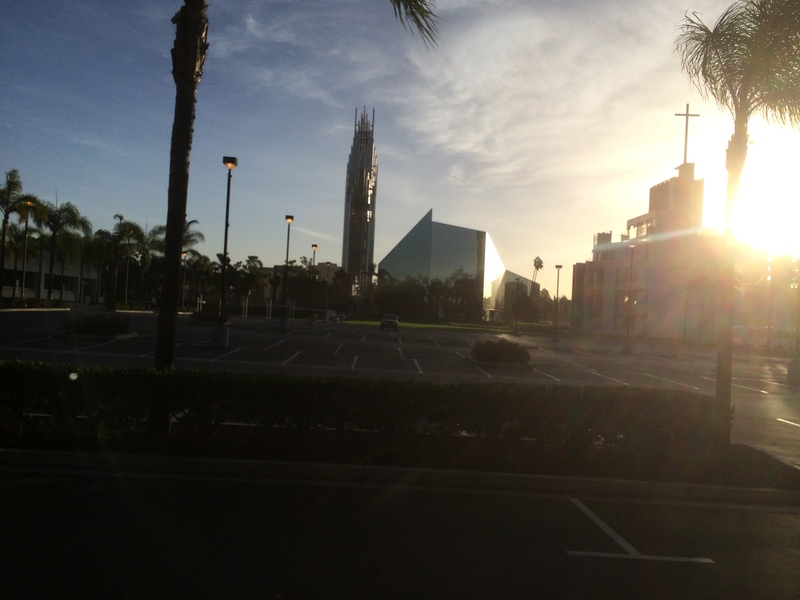 Not too far up Chapman Avenue, we turned into the parking lot at the Crystal Cathedral. Between the position of the sun and the wind, I’m really surprised how well this picture turned out. I kept turning out my intervals, though. By the time we got on Lewis Street, the winds were so strong it was a little scary to be running. Along this road, I had the wind push me to the side a bit while running. I even thought that the whipping wind might knock me off my feet. I didn’t get a picture of the one overpass we had to contend with. I took a picture of it when I did my training run over these streets. Once I saw the overpass approaching, I thought to myself…kill the hill. I did just that. Despite a strong head wind, I ran all the way up. It felt so good to get to the top. Now, I know it wasn’t a large hill. However, to be nearly 6 miles into this race and be able to run the entire way, I was happy and feeling rather strong! 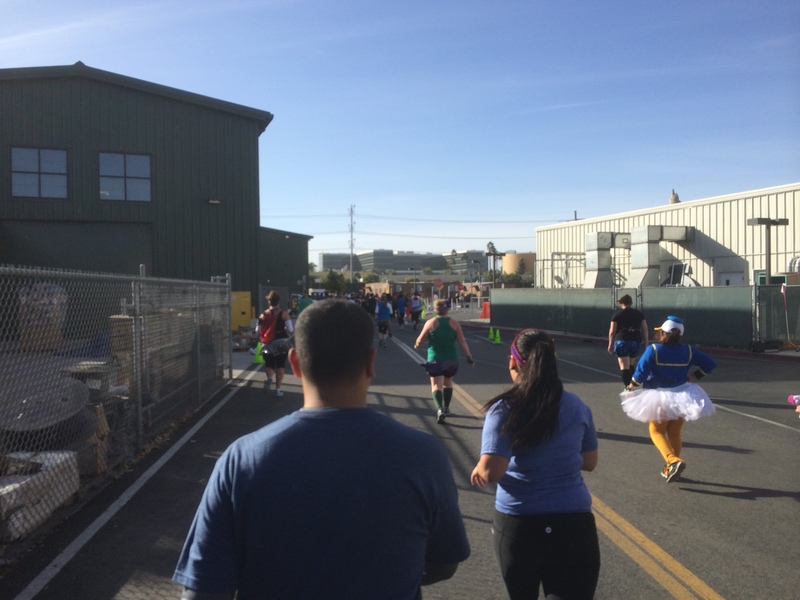 By the time I crossed the 10K mat, I had taken a considerable amount of time off my pace. I went from an expected finish of 3 hours, 20 minutes to 3 hours, 2 minutes by this point! Now, I could live with that! 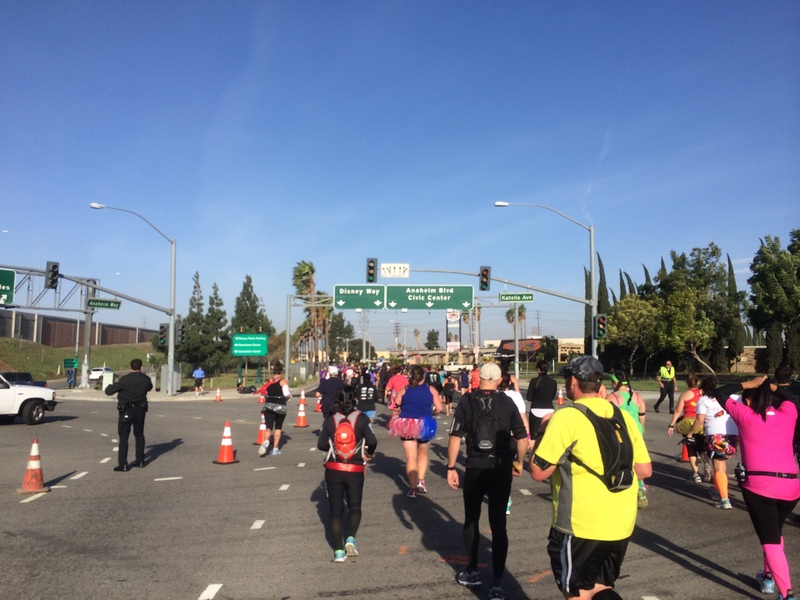 We turned left on Garden Grove Blvd and headed towards the Santa Ana River Trail. This is the part most of us were dreading. 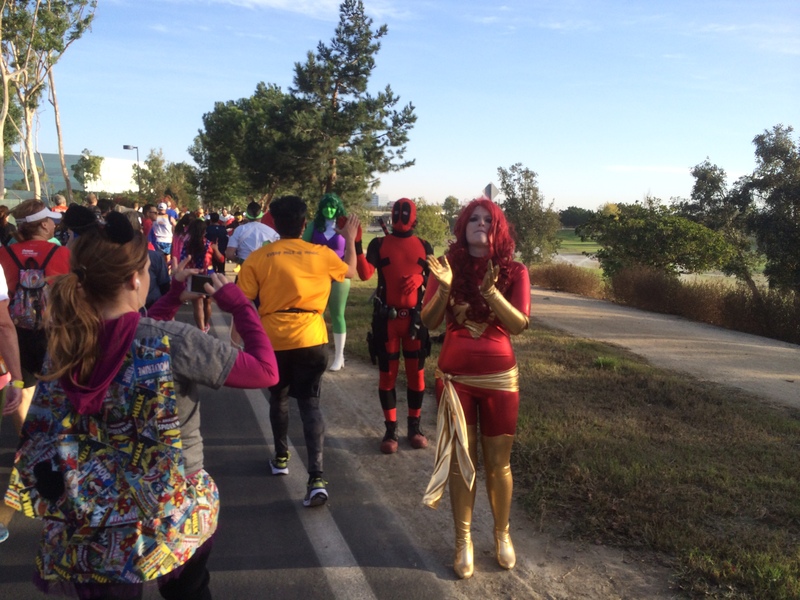 On the trail, we were greeted with members of the Avengers Initiative members decked out in various Marvel Character gear. A friend of mine was War Machine. So, I had to stop for this picture with him. He had sent me a text message while I was waiting to tell me where he was going to be. So, as we approached the river trail, I wanted to make sure I appeared in good spirits and full of energy. This section of the river trail was AMAZING! 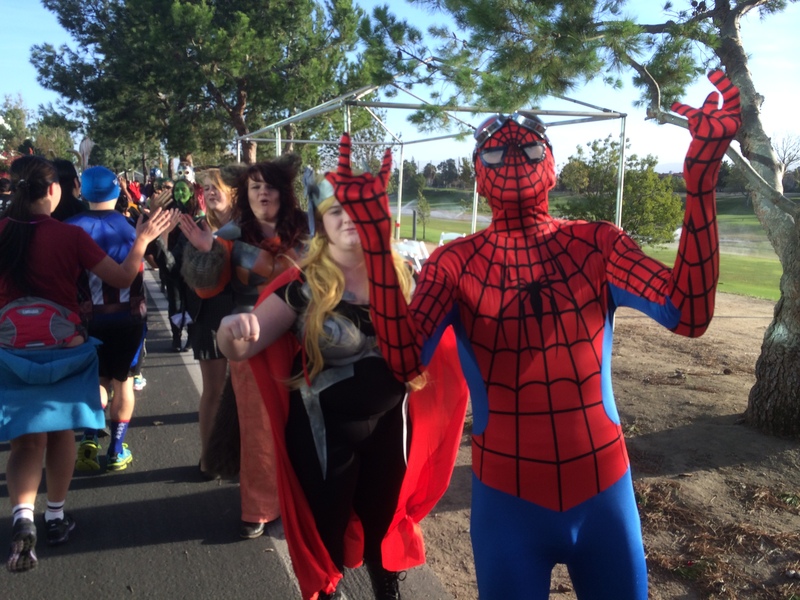 There were so many characters out cheering us on in this part. It was sooooooooo much fun! Hey again Cap! The funny thing about this part were the Hydra agents along the way. They told me to join Hydra because Hydra loves me! To see some more pictures of this group, click here for their Flickr page. If you couldn’t tell, the winds were just crazy. If you look at this picture, you’ll see sprinklers in the background. The wind was blowing the water all the way up to us. This poor mile marker has seen better days. Yes, the wind continues to be strong. 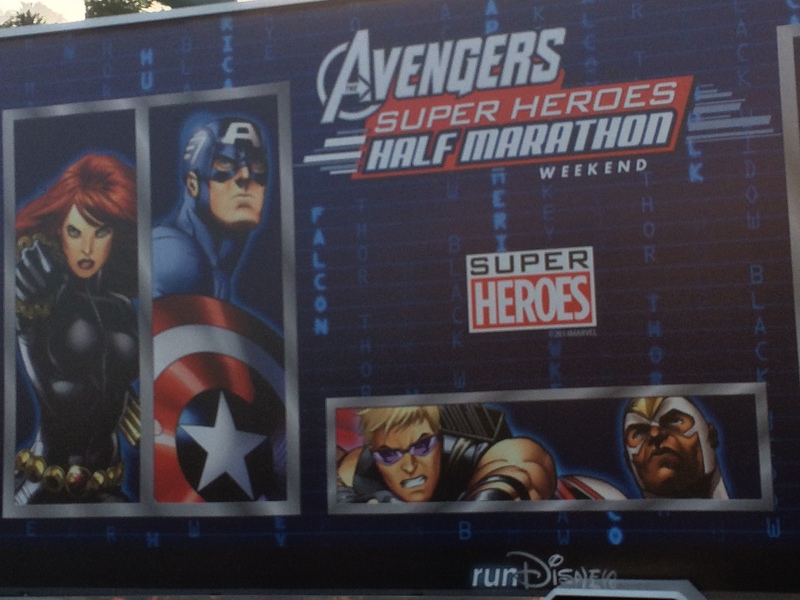 Hand it to runDisney, though, they did spruce up the trail a little with these banners. 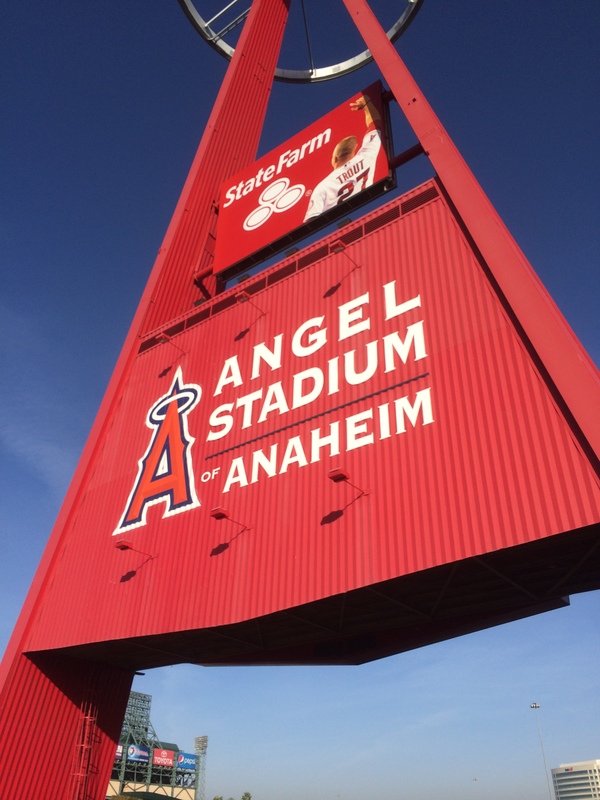 Seeing the Big A made me very happy! 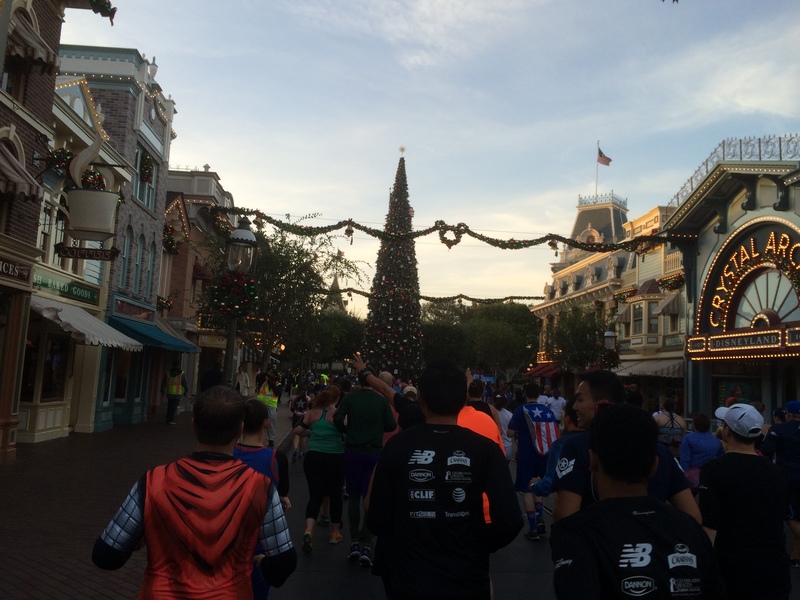 Shortly before we got here, I came across one of my fellow Team #runDisney peeps…AJ. He was in a boot for the Expo. So, I was surprised to see him out on the course. 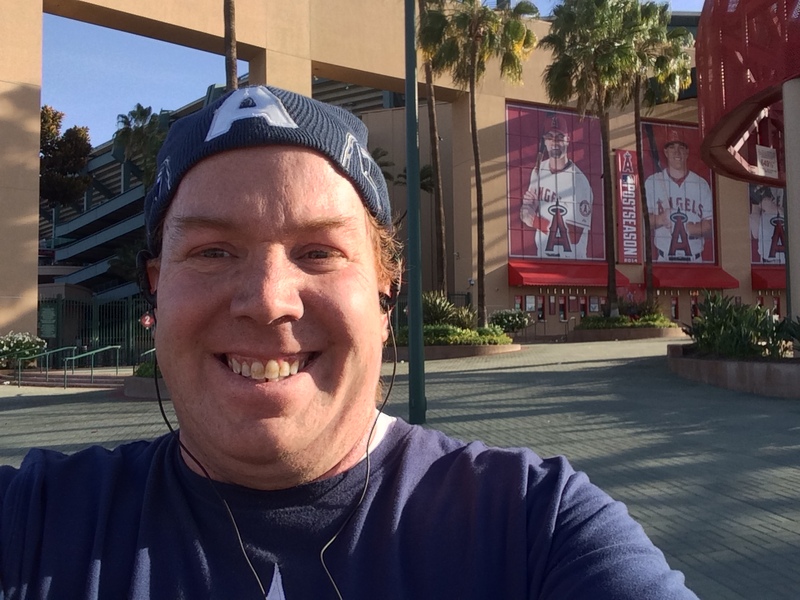 So, we walked and chatted for a little bit before we got to the Big A. Then, I took off. Ok, I’ve got to keep it real here. 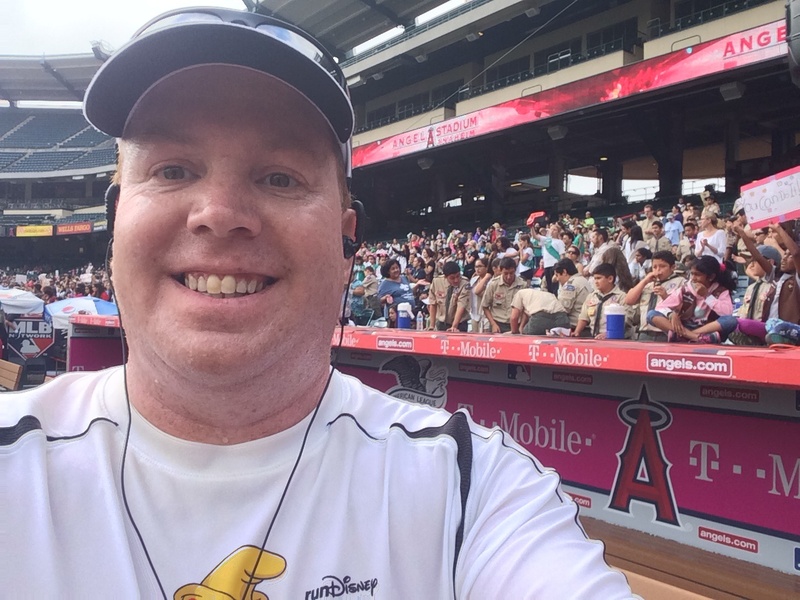 Running the Big A was not nearly as cool as it was during the Disneyland Half Marathon. You could see it from the river trail. 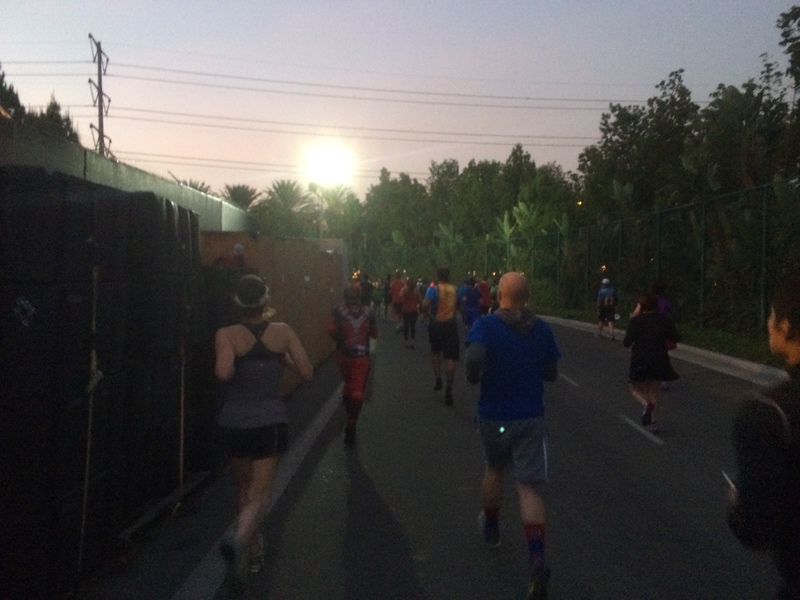 There was no crowd of people cheering us from the time we left the river trail into the stadium. There was next to no one actually. When I got to where this picture was taken, the stadium looked pretty empty. 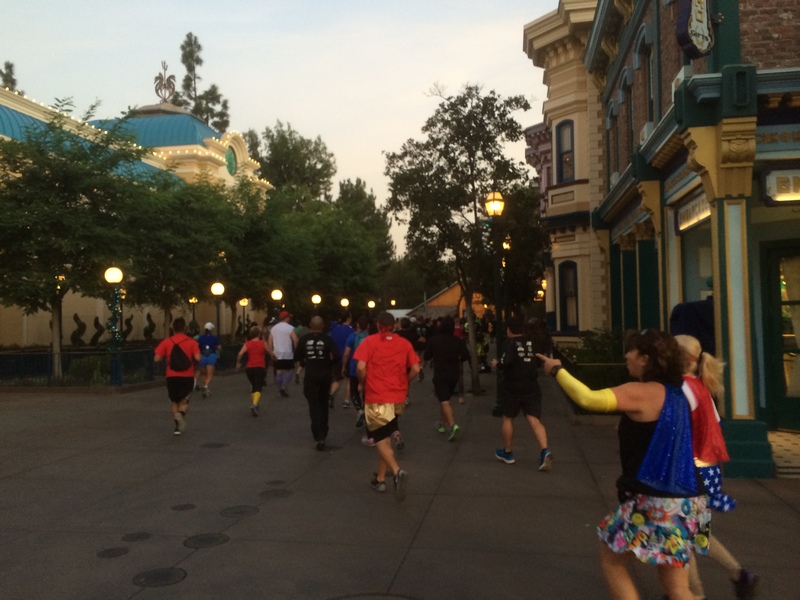 Unlike the Disneyland Half Marathon, they did have a couple marching bands. However, this is what we saw in the stands…. 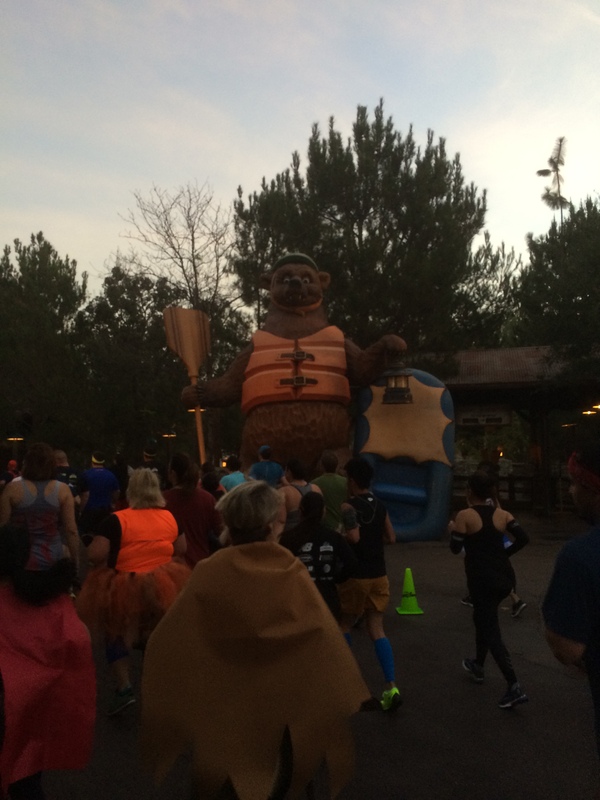 At the Disneyland Half Marathon, we saw this in the stands…. 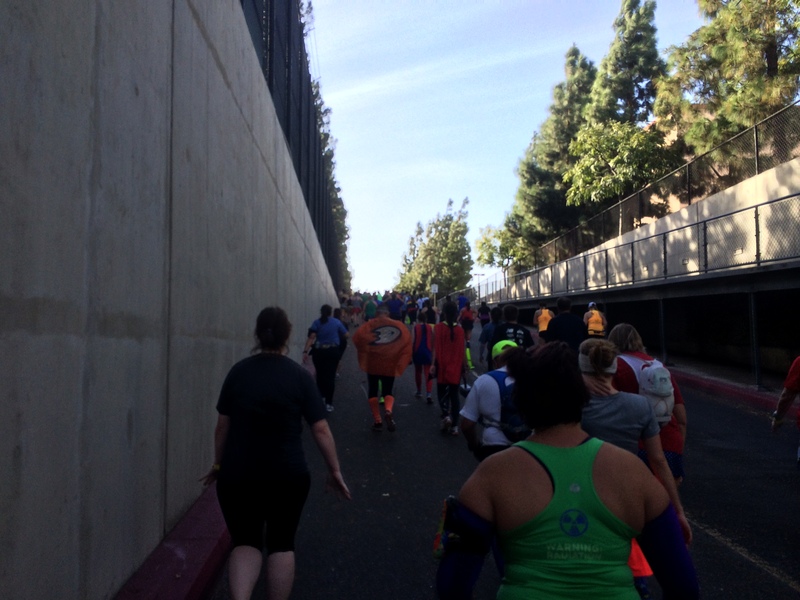 Here’s a shot from the Avengers Super Heroes Half Marathon…. 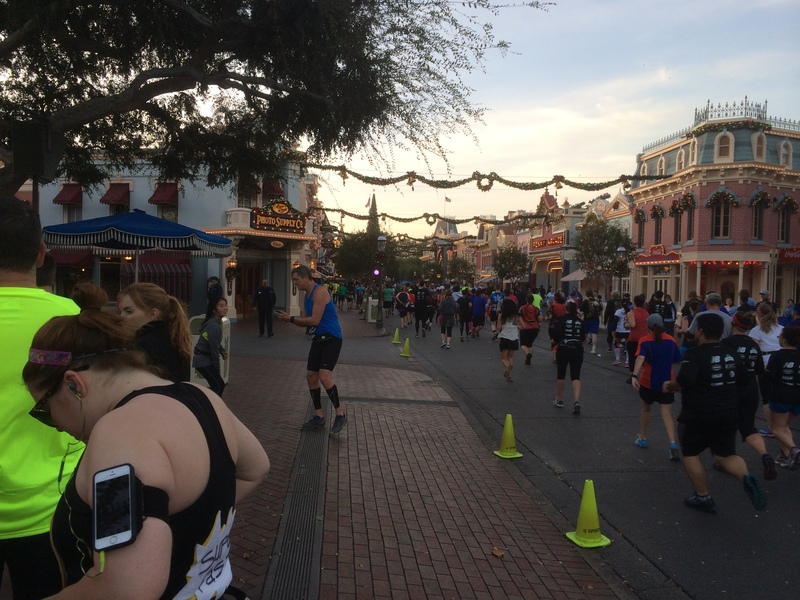 Sorry, last comparison….Disneyland Half Marathon. Don’t get me wrong. 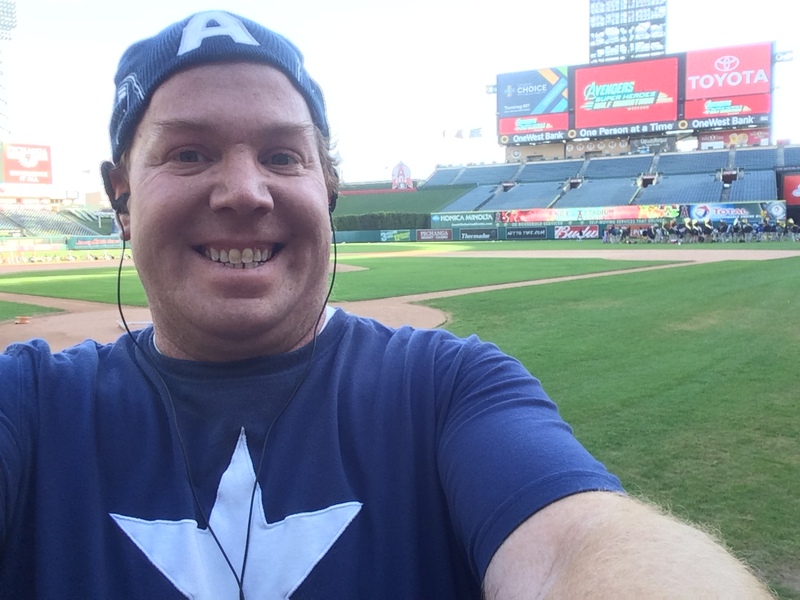 I love running through the stadium. It was still cool. 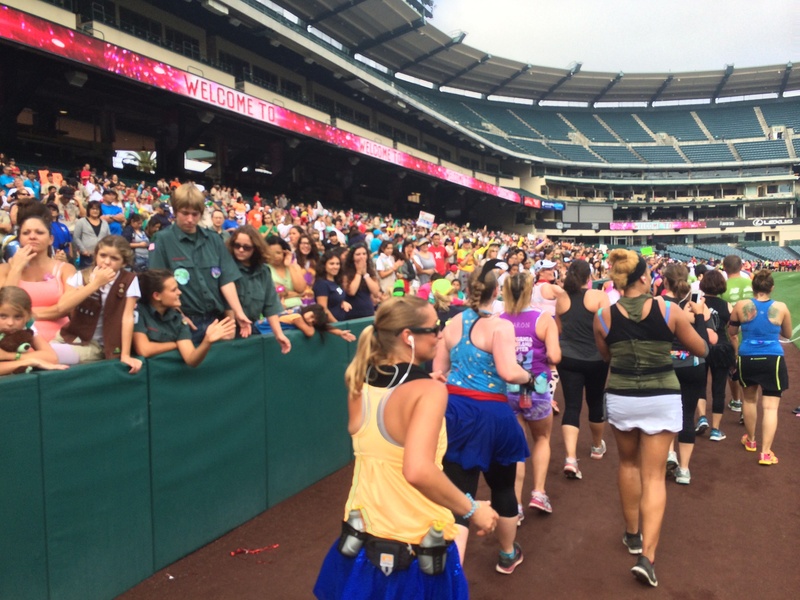 It’s just that running through the stadium for the Disneyland Half Marathon gives you goosebumps. So, I kind of missed that. Even though the crowds weren’t there, it was cool to see the Post Season signage was still up! 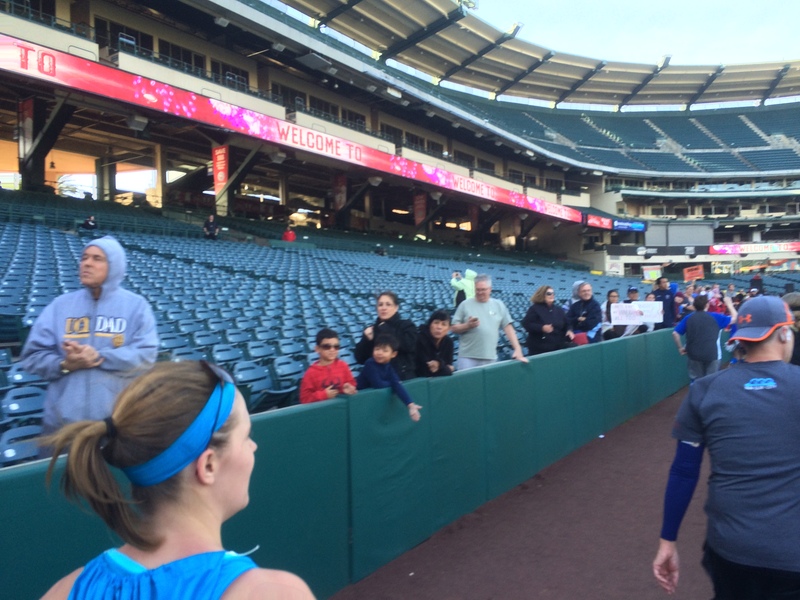 So, that is one thing this race had that beat the Disneyland Half Marathon experience at the Big A. 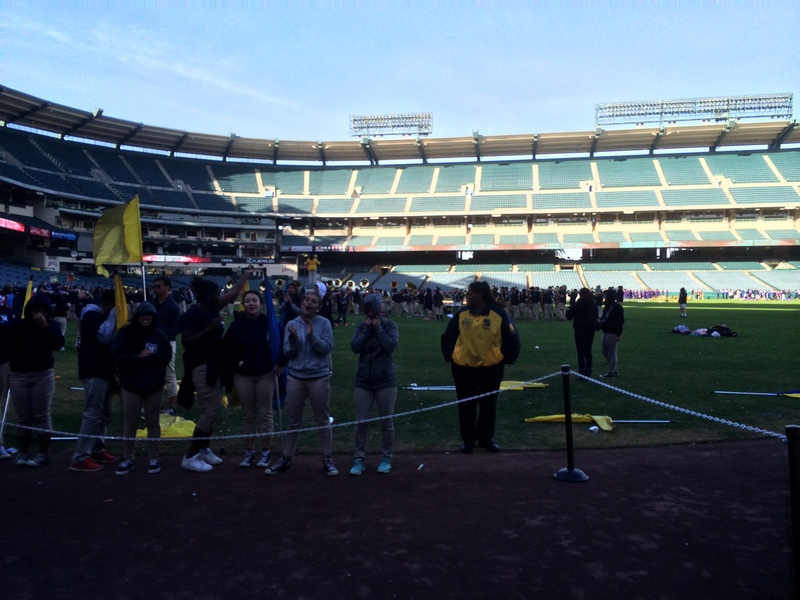 Sadly, we did have to make our way out of the stadium. 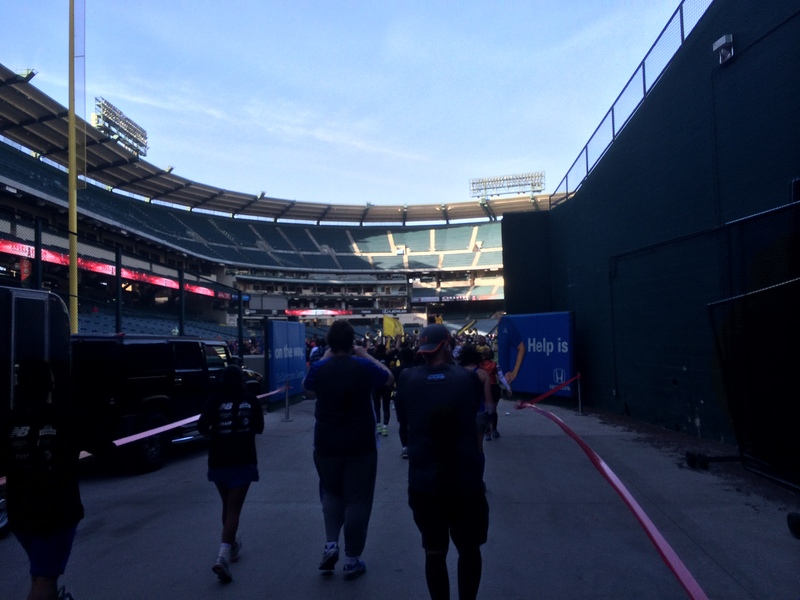 I did run up this little incline out of the stadium! Mile 8 finished! So was the sign! I veered off course a little to grab this picture. Congrats Mike Trout on winning the American League MVP! Go Halos! 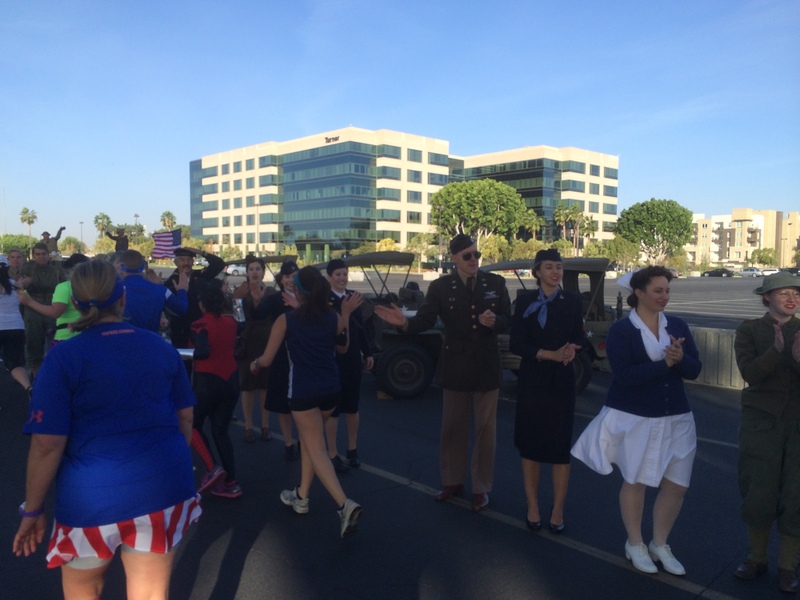 On the way out of the stadium parking lot, there was this surprise…lots of World War II era dressed people and military vehicles. I could tell that I had slowed down a little bit by this point. 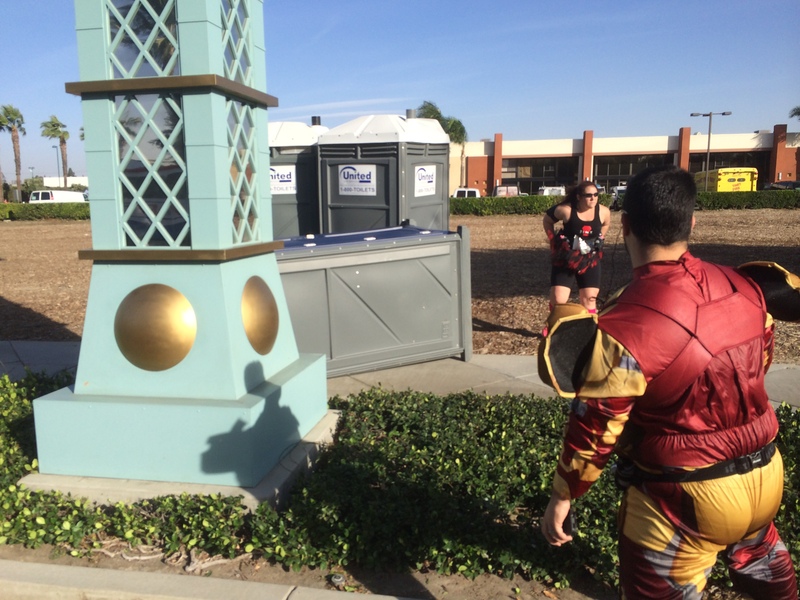 Also, I had to stop for port-a-potty break about this point. I needed to use them and there was no line. So, it seemed like a good time to do so. When I came out, I felt the need to start making up some time. 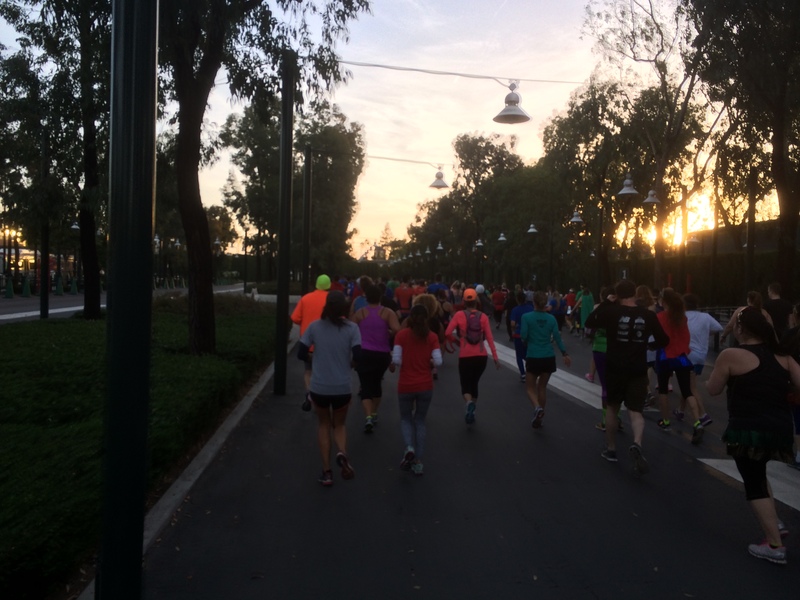 Leaving the stadium, we approached the part of the course that was very similar to the end of the Disneyland Half Marathon course. 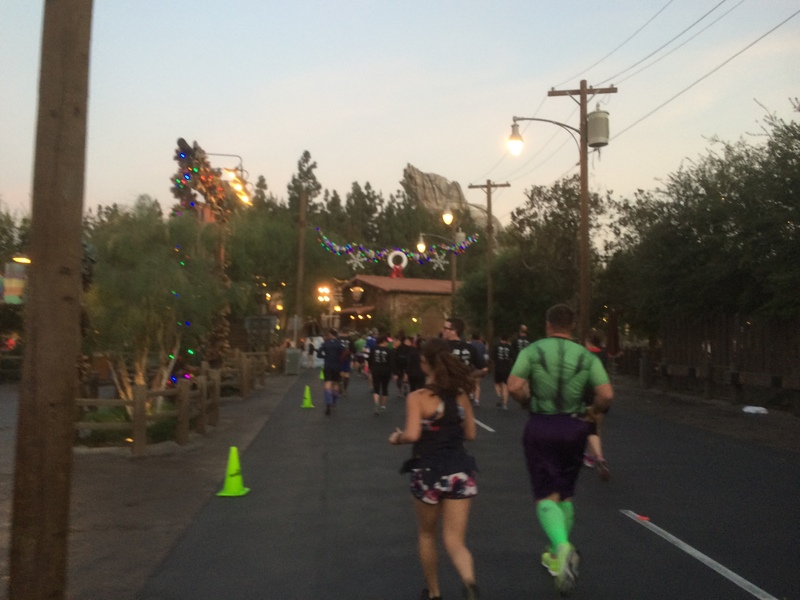 These roads have defeated me in my two Disneyland Half Marathon attempts. So, I prepared myself mentally to just keep to my intervals. I should back up a bit and say that, once I crossed the 10K mat and saw that I was running at a better finish time, I went back to the 30 second run/1 minute walk intervals. 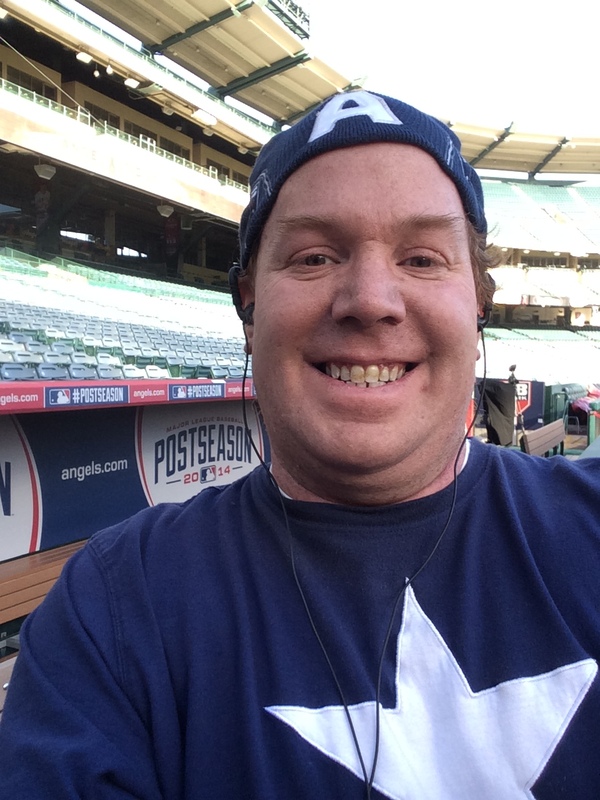 So, as I left Angel Stadium, I got back into a rhythm. I kept telling myself that I wasn’t going to let this part of the course defeat me again. It was time for revenge. It’s amazing how much cooler temps can help you out. 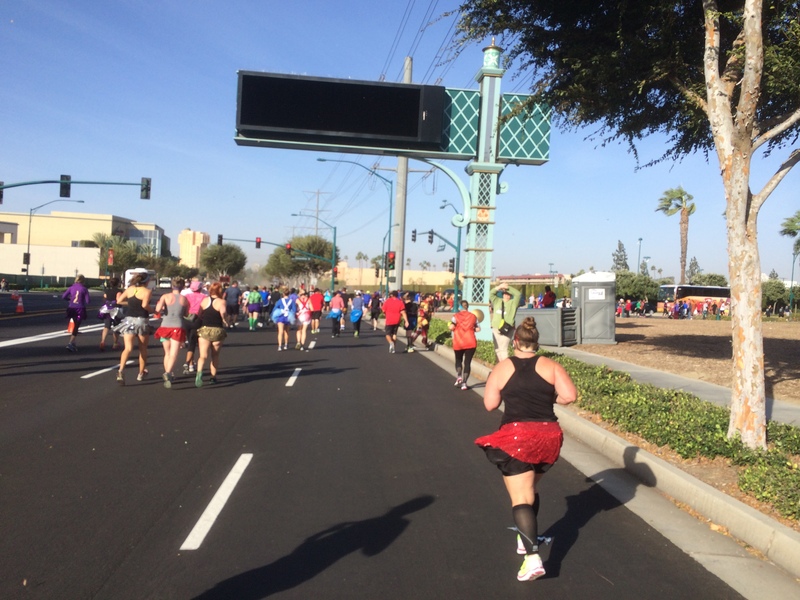 At both of my Disneyland Half Marathons, by the time I got to the above intersection, I just wanted the race to be done already. 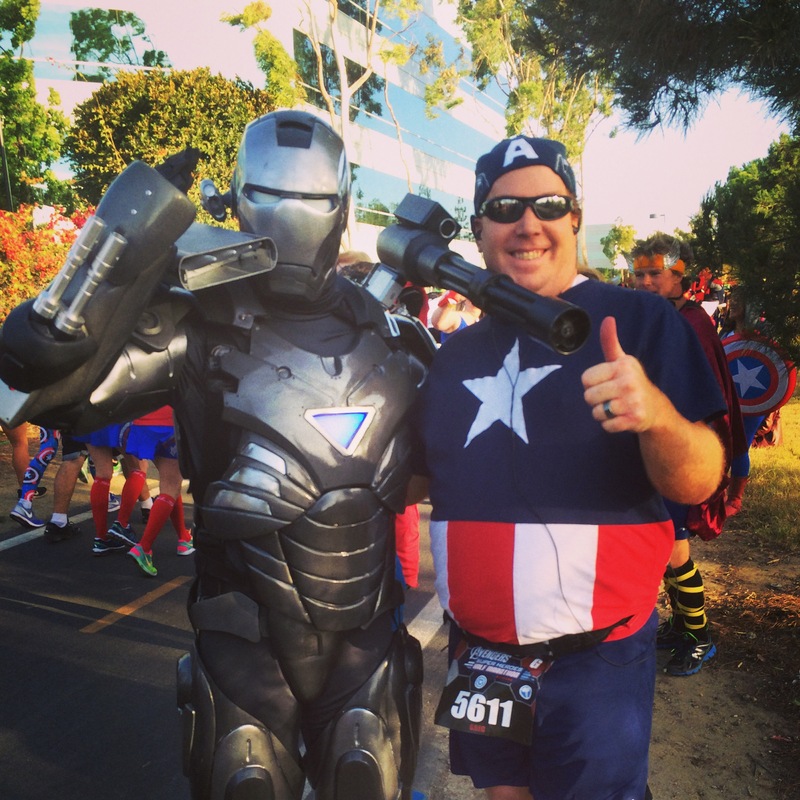 Not so at the Avengers Super Heroes Half Marathon. I was executing my intervals perfectly. 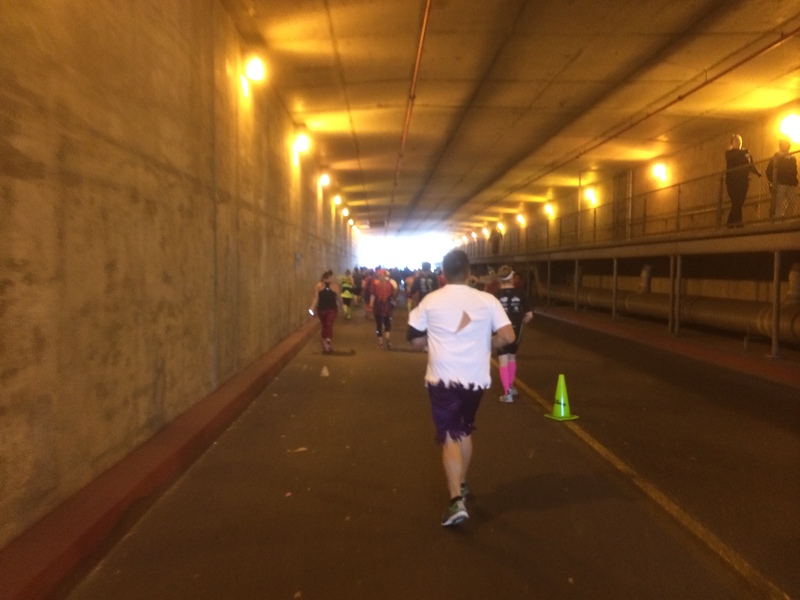 This tunnel at the Disneyland Half Marathon is heavenly as it’s a break from the heat. For Avengers, it was just a tunnel. I kept my intervals going. By this point, I didn’t care about overall finish time. All I wanted to do was finish the race strong. 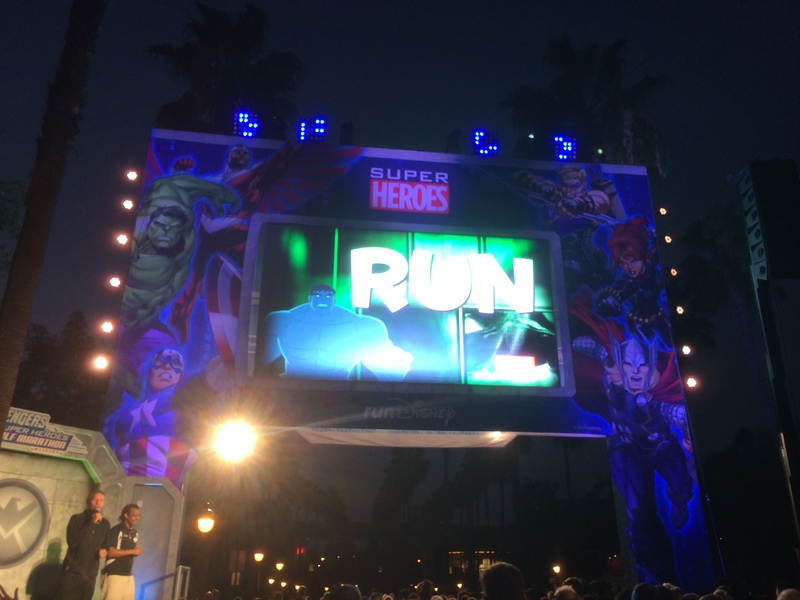 Past the tunnel, the Avengers course veered off the Disneyland Half Marathon finish. Do you see the port-a-potty that is blown over? The winds were seriously strong! 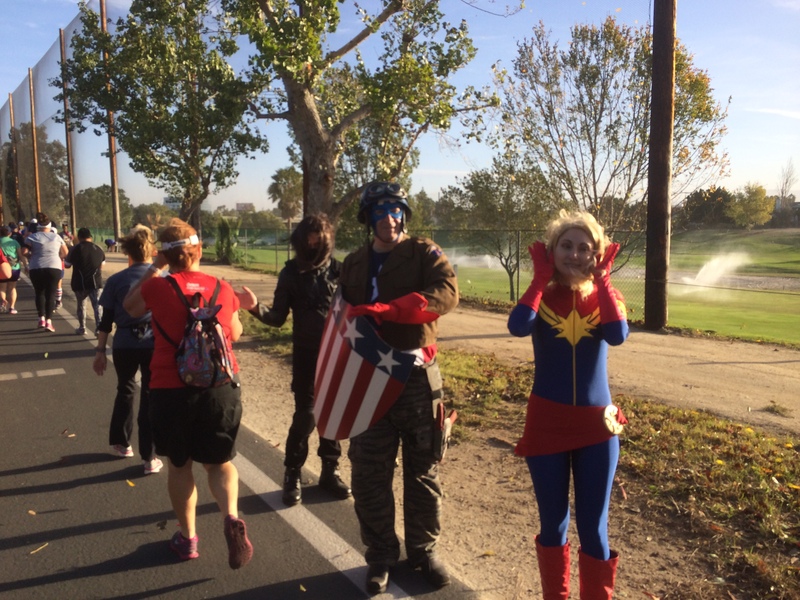 The Avengers course ran by the 5 freeway. The winds never seemed to let up. My will to keep going was strong. As we approached Harbor Blvd., I started feeling really happy. I knew we were about to enter the last back stage stretch of the race and I was still going strong. and made our way backstage at Disneyland again. We headed down our last downhill. Towards the bottom, a lady lost control and almost completely face planted in the road. It was scary and a sobering reminder of how easily things can go bad. There were about 5 or 6 runners that stopped to attend to her and make sure she was okay. Two other runners turned around and ran back up to get help. 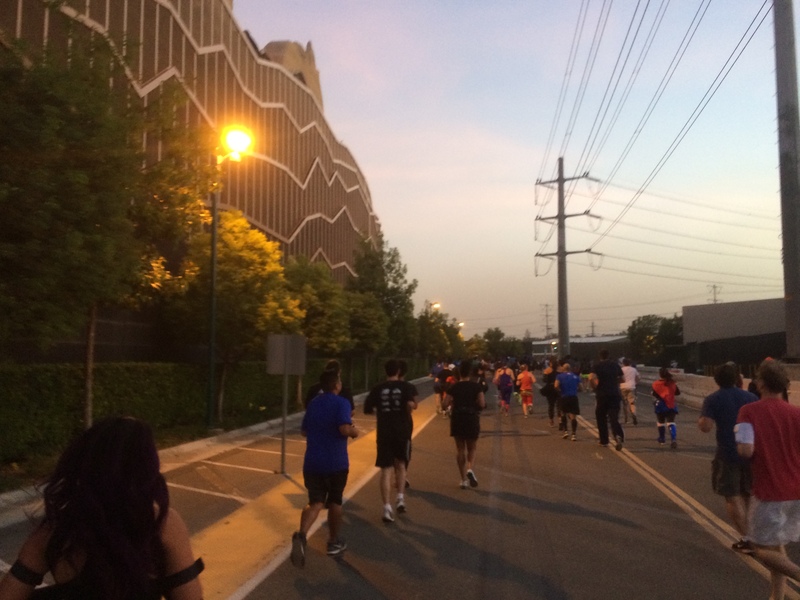 I seriously love the running community! We do a great job at looking out for each other. I decided to continue on because it looked like this fallen runner had plenty of people to help her out. I hope she was okay. The fall did not look good at all. 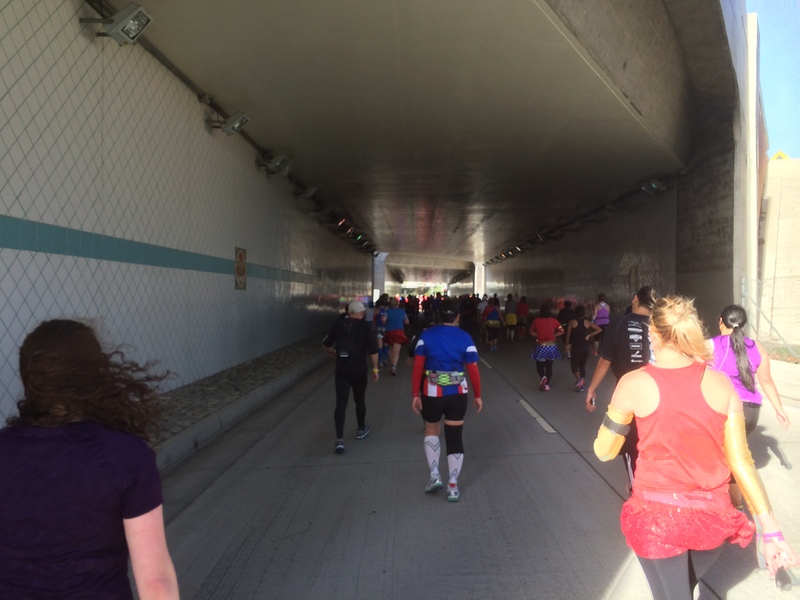 I ran down the hill into the tunnel because it was in my run/walk pattern. However, as I got to the bottom, I realized that I might hit a run interval right as we had to go back up. So, after a 30 second walk break, I started a run interval. That got me to the start of the last uphill of this course. Once at the top, it was time to run again. 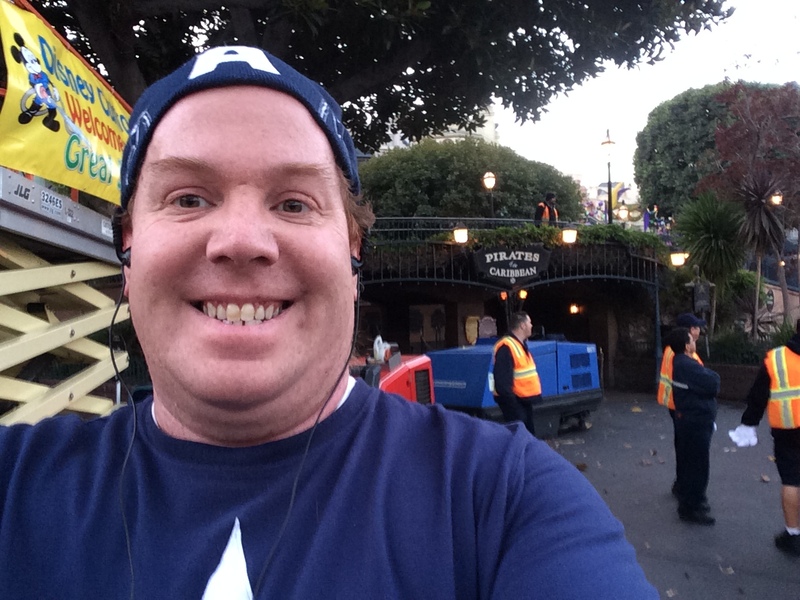 Backstage at Disney California Adventure again. As I run/walked/ran my way through this part of the course again, I thought of how it felt to run here earlier in the race. 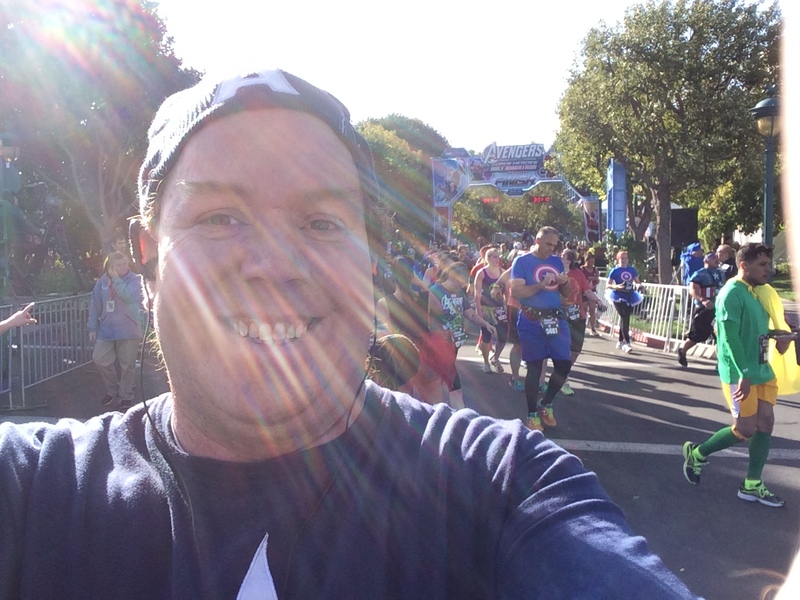 I was actually feeling strong and almost as happy as when I was running the opposite way in mile 1. I kept looking for a 12 mile marker and didn’t find one. We got to a water stop where the volunteers told us we had 1 mile to go! 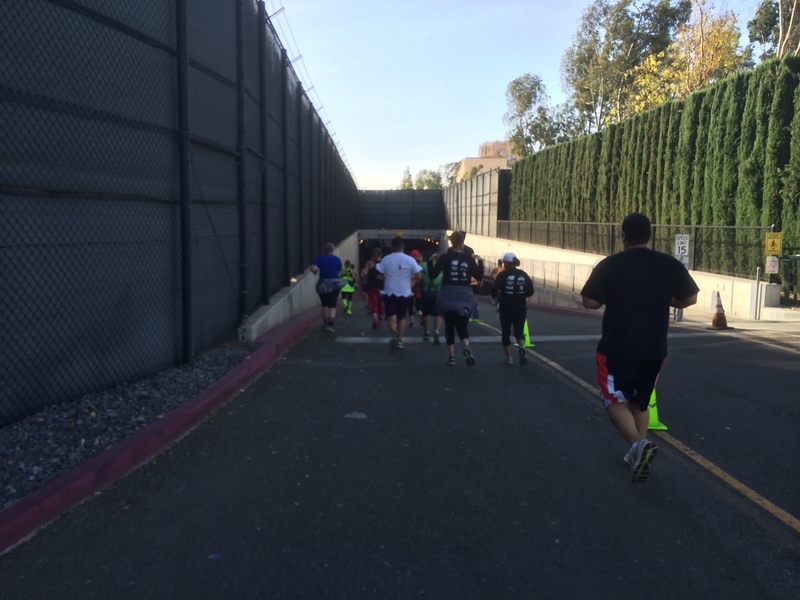 As we ran the last full mile, we got some awesome tail wind to help out. It felt heavenly! I think that once or twice, at the end of a run interval, I put my arms out like I was an airplane. It felt so good to be this close to the finish and not want to die. I couldn’t help but smile. I was still in control of my running. 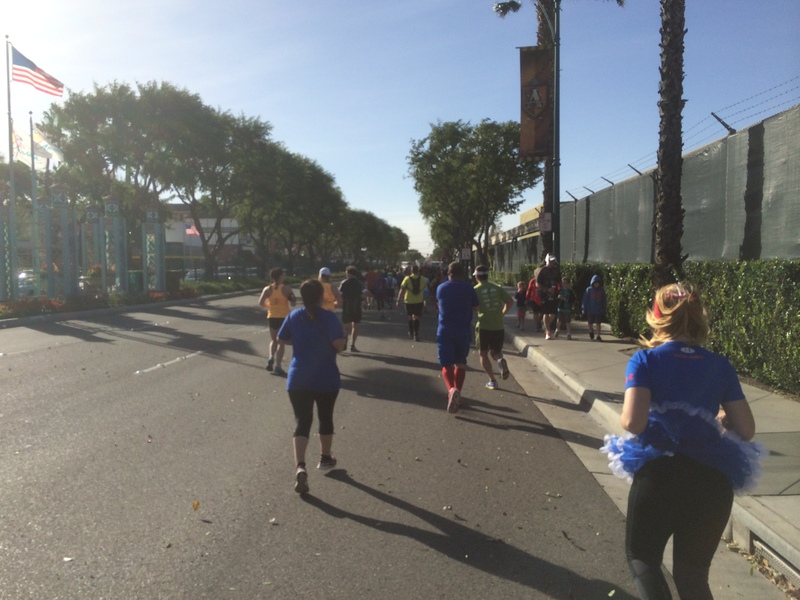 By the time we got to the Paradise Pier Hotel parking lot, I started realizing that I wasn’t going to finish in under 3 hours. By the time I got here, I knew I’d be over. So, I decided to have as much fun with the finish as I could. 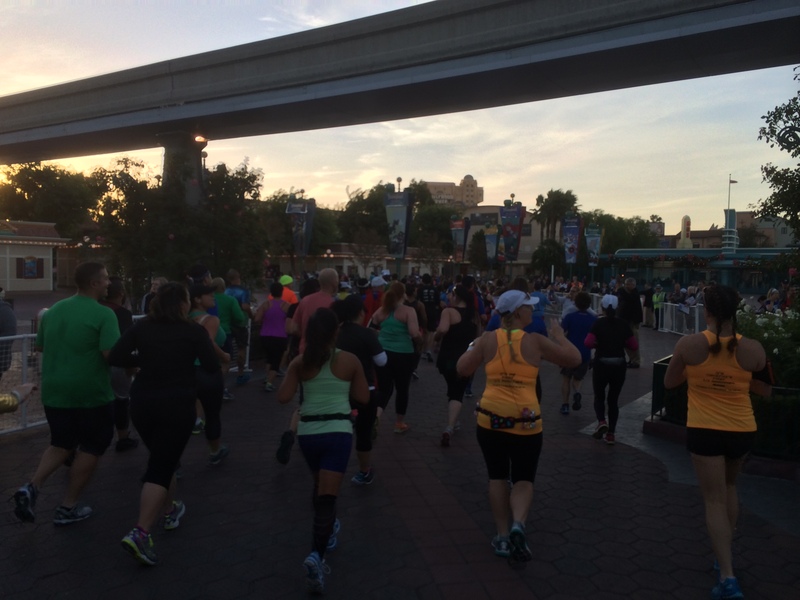 Along this stretch, I think I heard someone shout out this blog’s name…as in Go Why I runDisney! If you’re a reader, I LOVED that encouragement! It brought a big smile to my face! 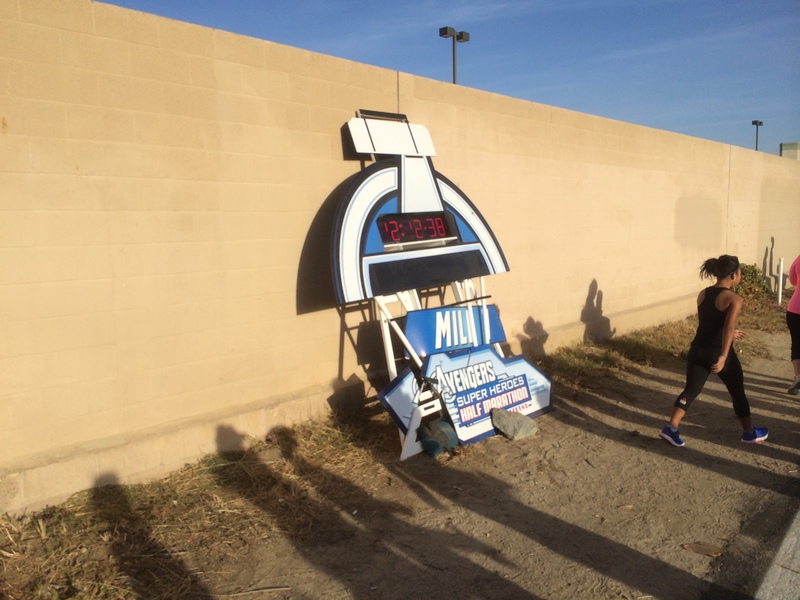 Normally, I wouldn’t stop for a picture of the 13 mile marker in a half marathon. However, since I was going to finish in more than 3 hours anyways, why not? Normally, this close to the finish, I’m just thinking about running fast to the finish line. 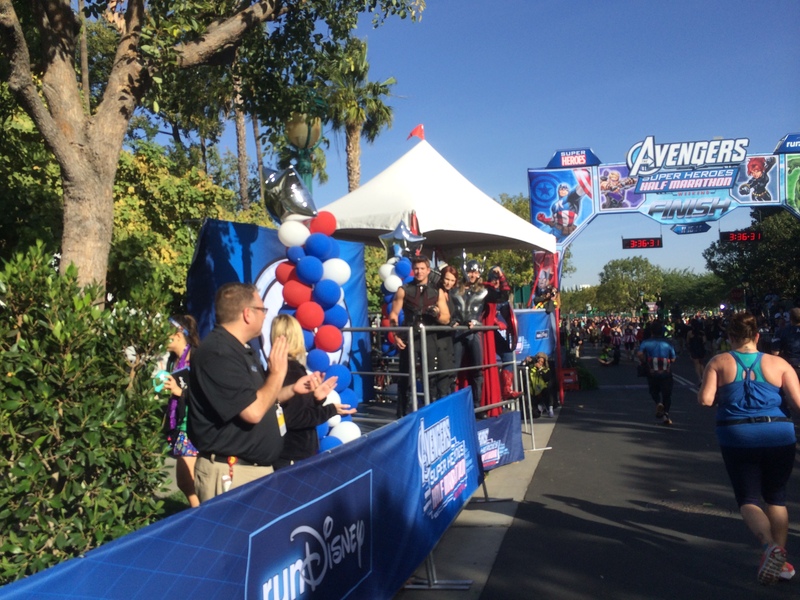 However, with a sub 3 hour half out of the picture, I wanted to get a picture of the Avengers at the finish line. So, I stopped. The sweet feeling of a race finish! 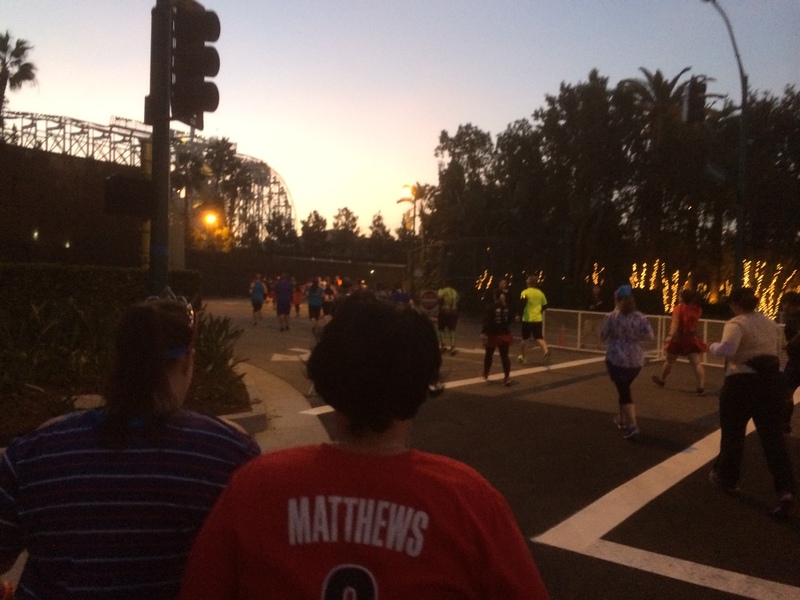 With the winds cancelling the finish line festivities, my friend and I headed to the Disneyland Hotel. We heard an announcement that there was something going on there. However, we found nothing. So, I thought this would make a cool photo spot with my newest bling! 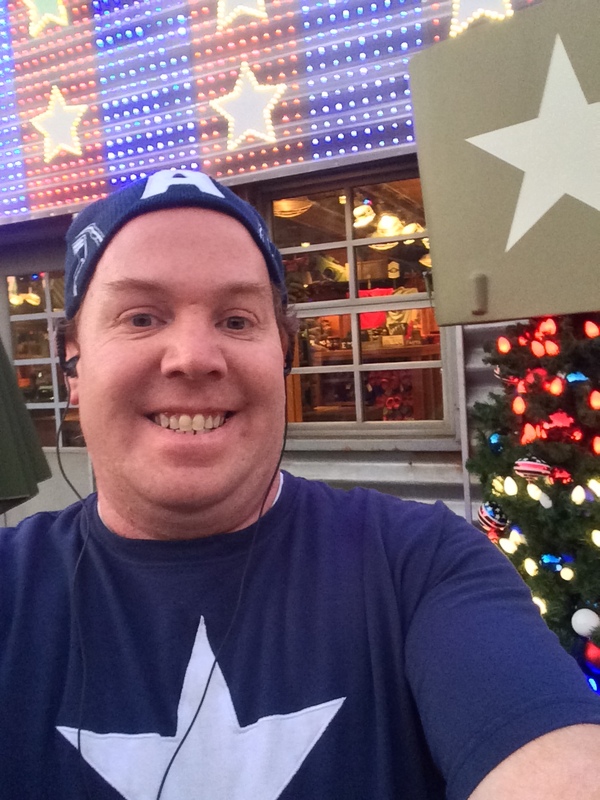 I finished the Inaugural Avengers Half Marathon in 3 hours, 3 minutes, 15 seconds. 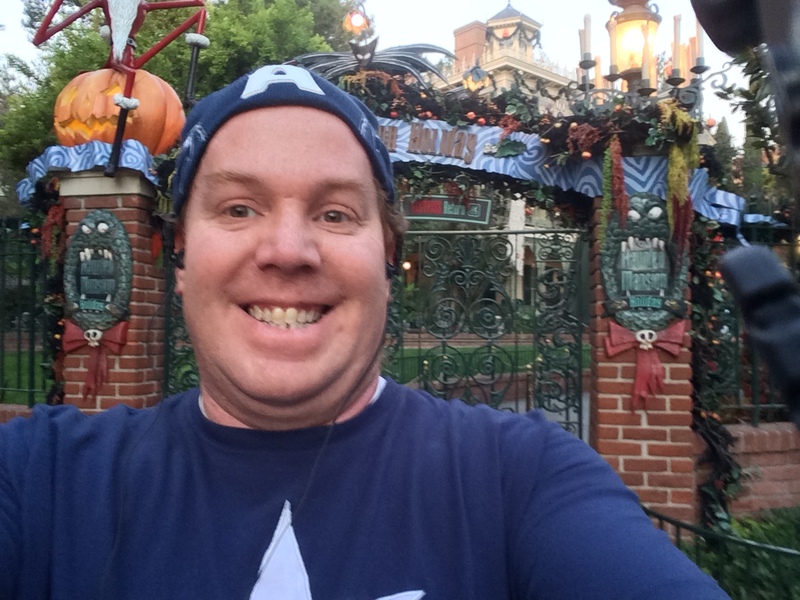 That’s my second fastest runDisney half marathon and an improvement of just under 10 minutes from my finish at the 2014 Disneyland Half Marathon! 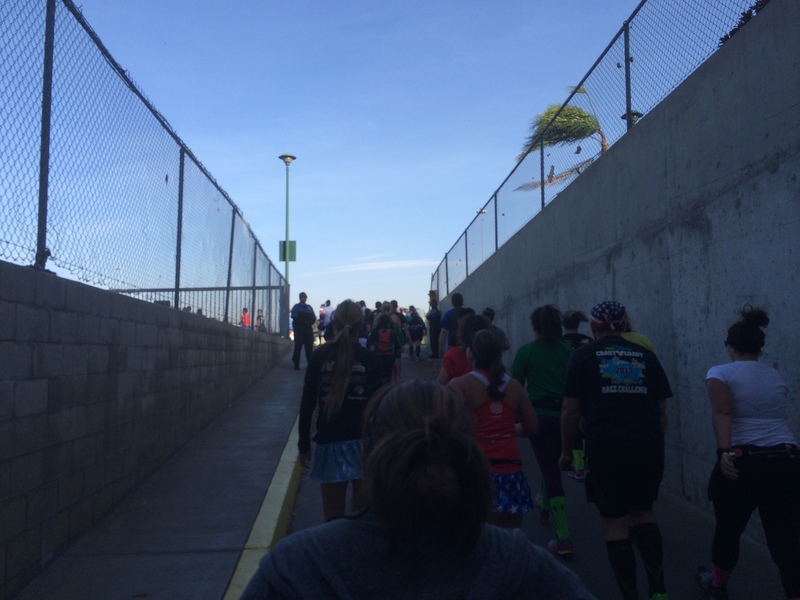 In spite of the weather conditions, this might have been my favorite half marathon yet! I really like the course. 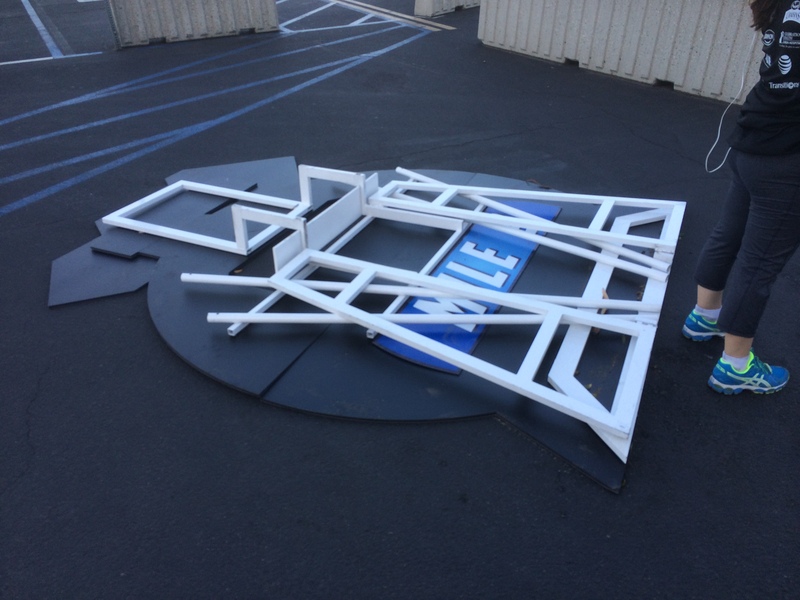 You can’t blame runDisney for the crazy wind. If that crazy wind hadn’t been present, our time on the Santa Ana River Trail would have been much more pleasant. 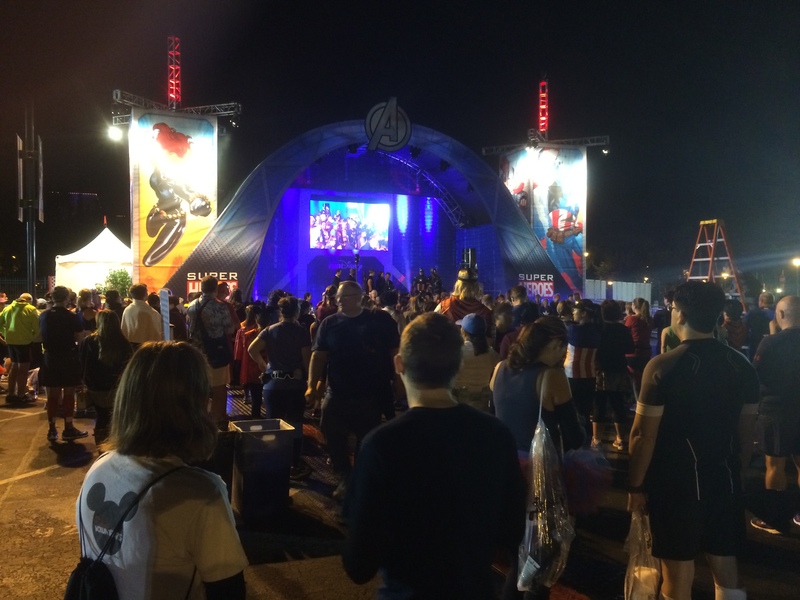 Hydra Agents may have tried to keep us Avengers from finishing the race. That’s okay. We finished anyway! Greg this was a great recap. What brutal conditions y’all had. Glad you weren’t in the porta-potty during the fill, that could have been nasty! 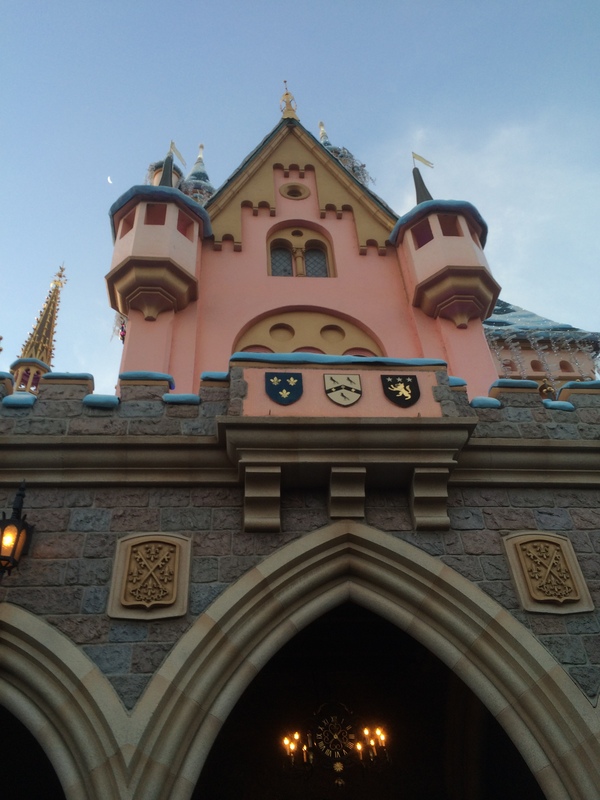 Security checkpoints at Disneyland? That’s not normal? We didn’t have those at the DL Half, did we? 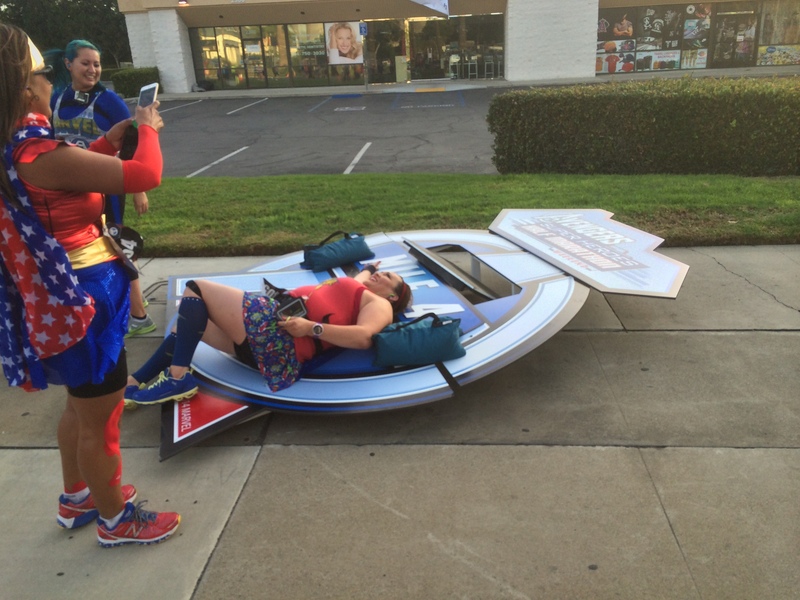 It was great seeing the Initiative on the trail, I guess that broke up some of the boredom! Sorry you couldn’t break 3 hours. If you would have been in G I bet you would have crushed it! You will get it next time, Star Wars Weekend would be a great opportunity to kill the 3 hour wall! I think you should frame the picture of you with Mickey & Minnie and put it on your new desk! Congrats! It was pretty brutal. 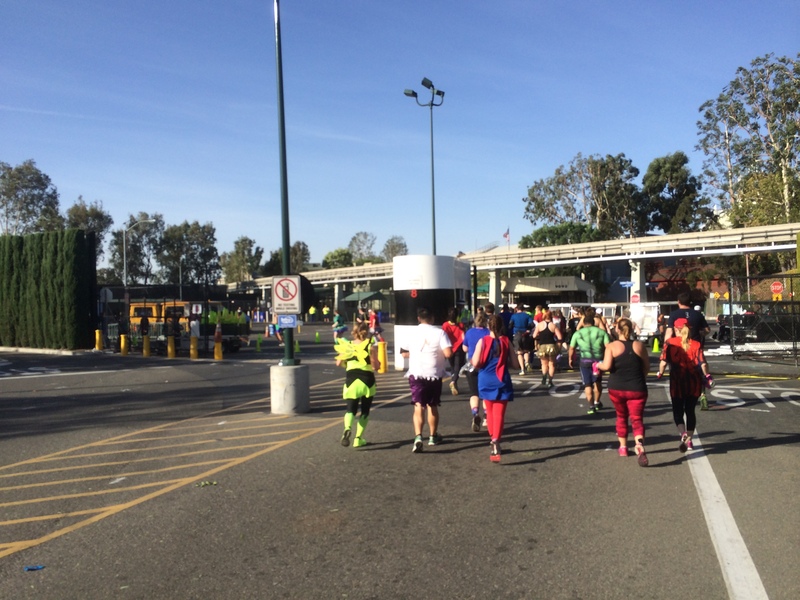 We didn’t run through the security check points for the DL Half. I honestly don’t know why they did so in this race. Further, I don’t understand why they shut off some of the lanes. It cause quite the bottleneck. I’m actually really happy with my finish time. 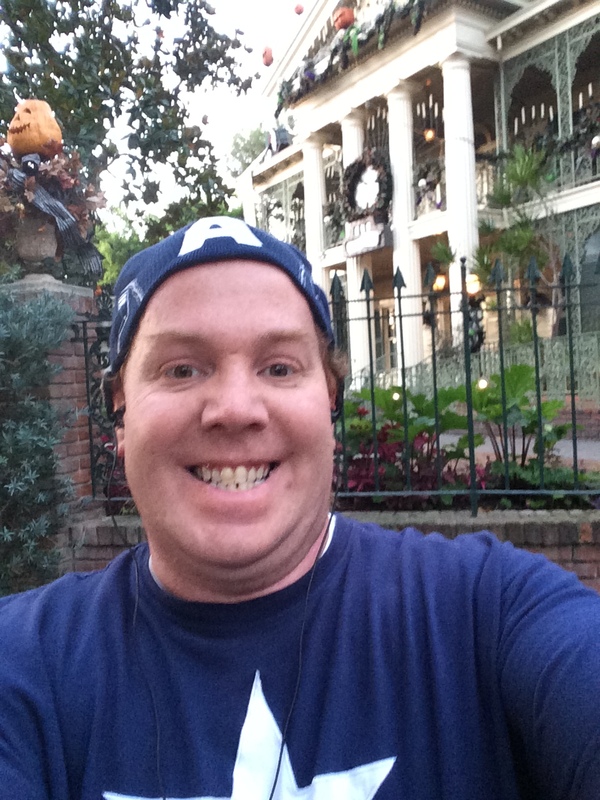 I went in with no expectations and still took off nearly 10 minutes from my Disneyland Half time! Not sure what to expect with Star Wars. I’ll be talking next week about my future plans. Oh my gosh! 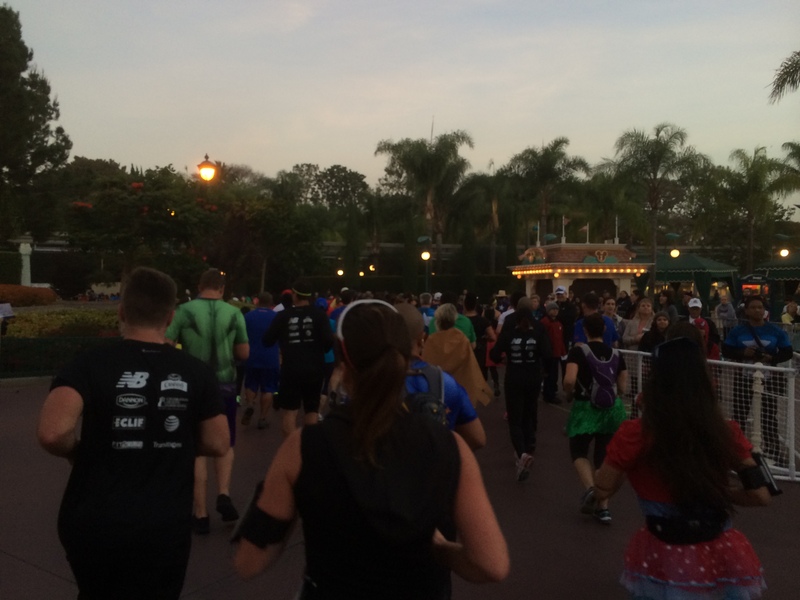 That was me that yelled “Why I Run Disney” at you. My daughter thought I was crazy, yelling out to a person I didn’t know. 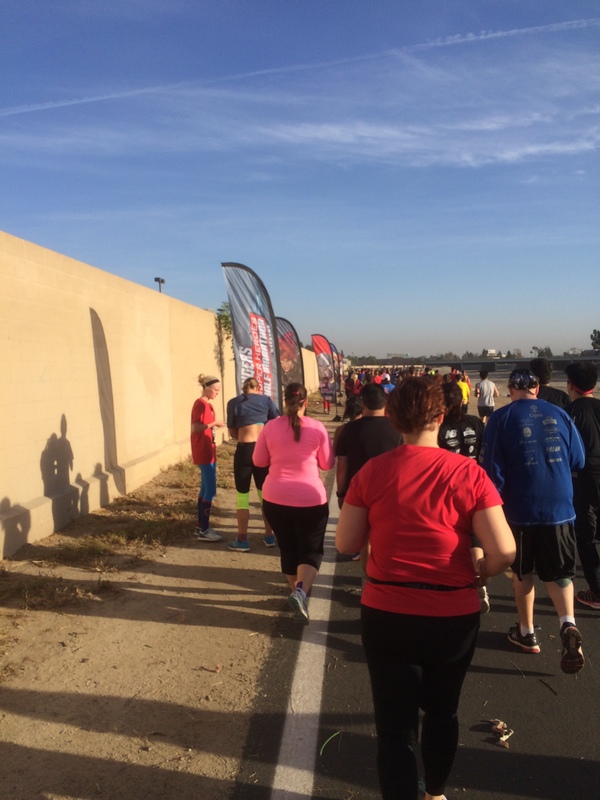 I didn’t run this one, my son did, so I was there cheering everyone on. Great job! THANK YOU! It really perked me up and made my day! So, thank you for that! It was a fun run, but the winds got to me half way through when we were on the trail. It took a lot out of me. I was so looking forward to the stadium as I heard wonderful cheering stories about it and was very disappointed. 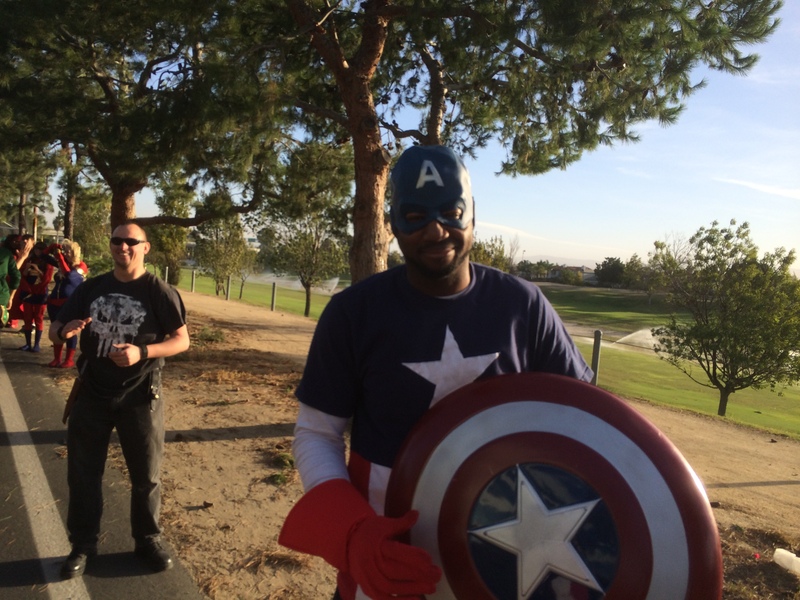 I did love the dressed up Avengers on the trail as well as the WWII people. I was also disappointed that they didn’t have an after party. I thought that might have been due to the wind as well. As you might have been able to tell from my recap. 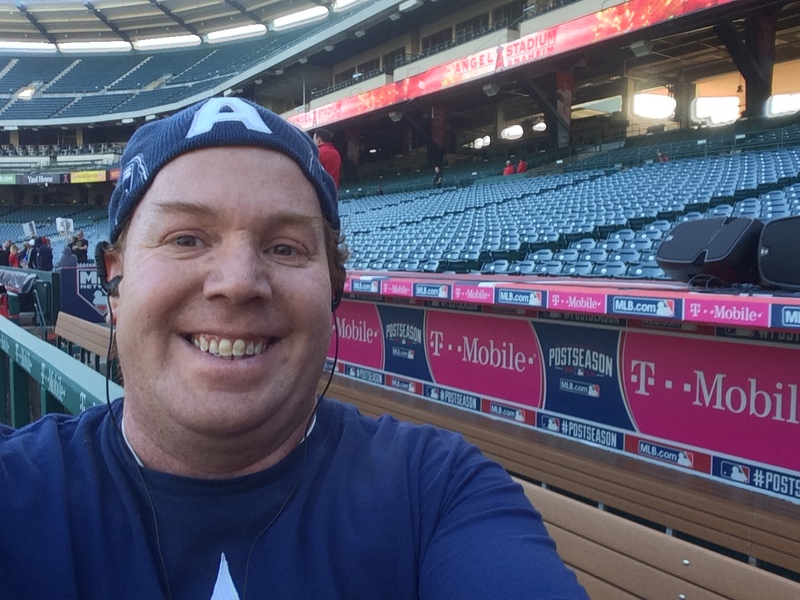 I was also a little disappointed with the lack of crowd at Angel Stadium. However, I love running there anyway. 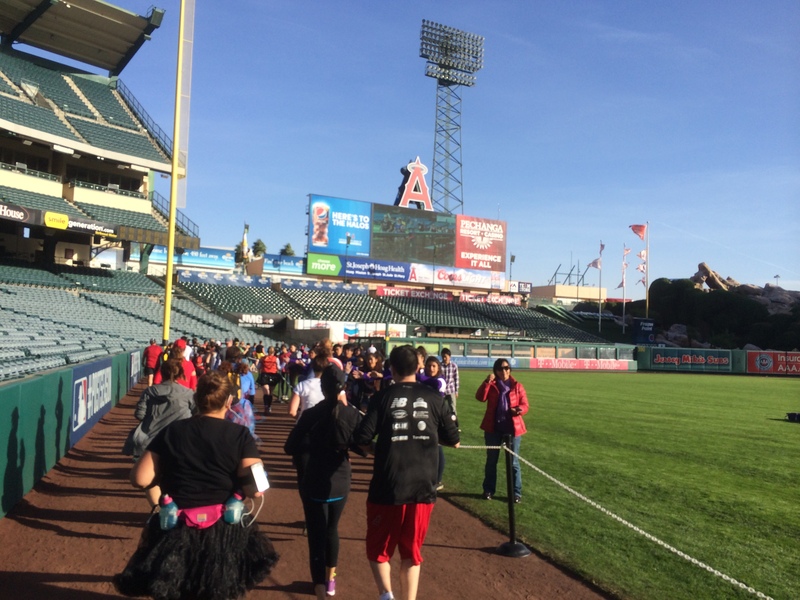 I’ve run in the Angels Baseball Foundation 5K for the past 3 years and they have rather small crowds inside as well. The after party was cancelled due to the winds. That was a bit of a bummer. 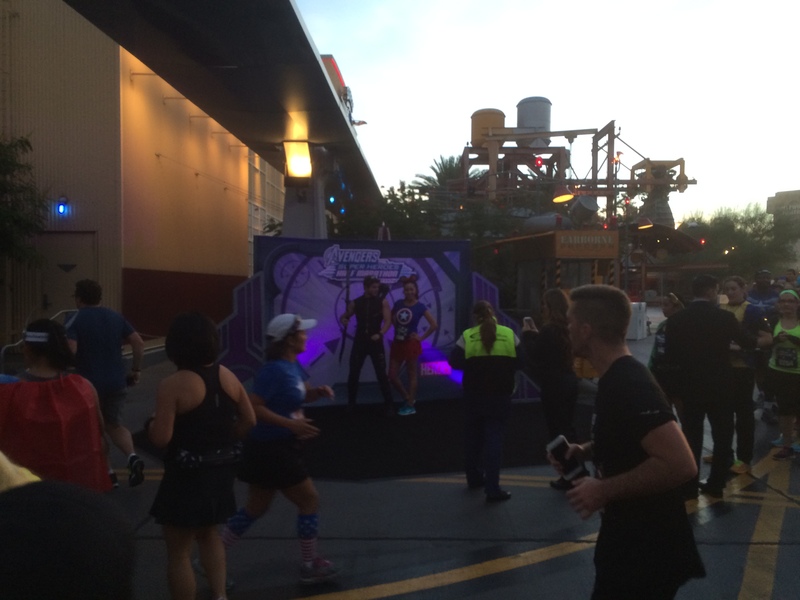 However, runDisney didn’t have control over that. The conditions were crazy and I definitely one of the Captains putting my shield over my face since my sunglasses blew away in one of the wind gusts! overall, i think this is a fast course. I stopped for a few pics (no avengers, those lines were crazy long!) and still finished in 2:43 which is 7 minutes off my Disney PR. i think next year without wind it will be a great course for sure! I agree. The course would have felt a little better without the winds. I was really happy with how they decorated the Santa Ana River Trail. If only the winds weren’t so crazy, it would have been a more enjoyable experience. I’ll be back next year to see how much better it will be! Sorry to hear about your sunglasses.